Posted on December 31, 2016 by Elizabeth E.
Last year I had this idea that I wanted to try, and so I rounded up some willing participants and we made ourselves a Spelling Bee. I started it by creating a blog that was dedicated to free tutorials to make these free-form letters, without the use of patterns or papers. Some were pretty wild, but it was a great challenge. And then we all started by choosing a phrase or a poem or a group of words and entered them into a Google Spreadsheet (we were all tired of trying to use Flickr). This is the wrap-up post, showing our collective work of The Spelling Bee ( found as #spellingbeequilt on Instagram, where we posted our photos). 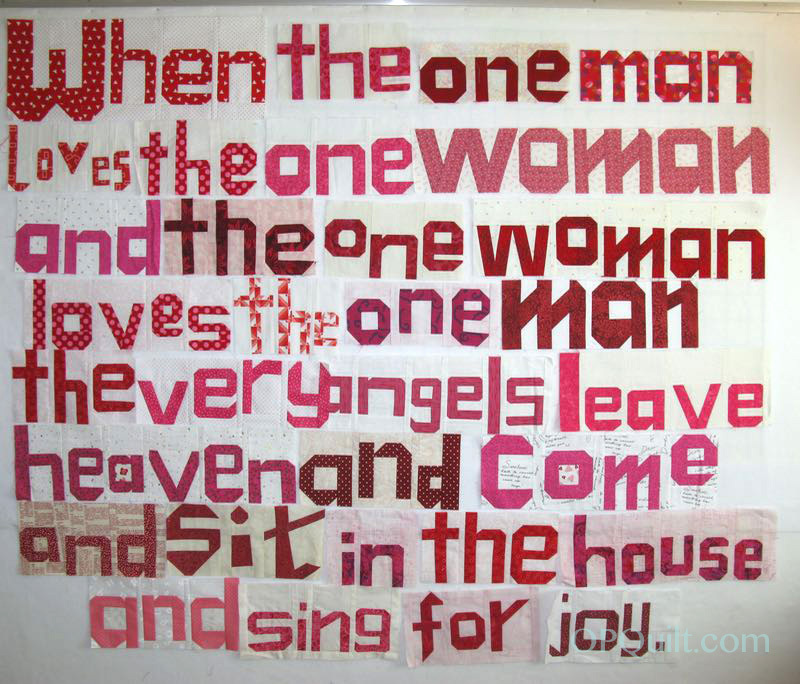 This is my phrase, done in reds, creams and pinks. I do have plans for it. 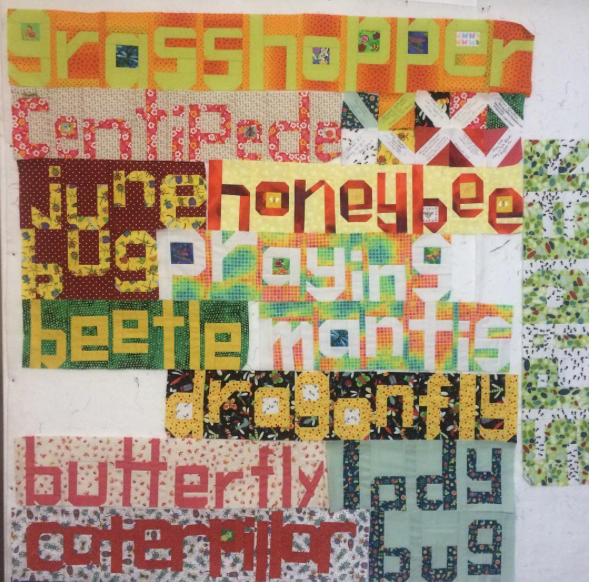 Lisa (aka Nymblefyngers on IG), a first-time bee participant, decided on lots of bug words for her quilt, and people carried out the theme by making them in bug fabrics. 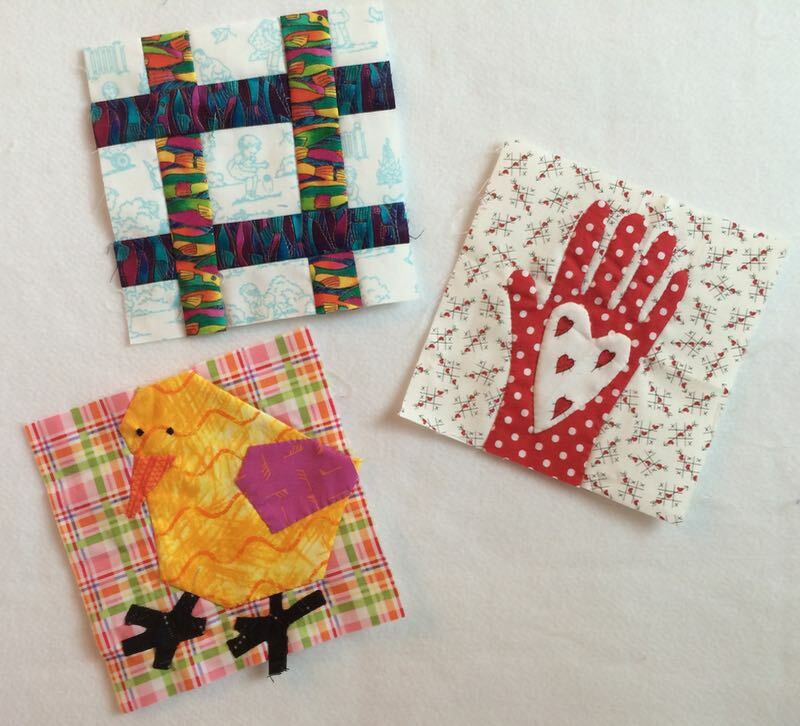 Mary, who writes the Needled Mom blog, made fun sewing-themed blocks to add to the words in her quilt. 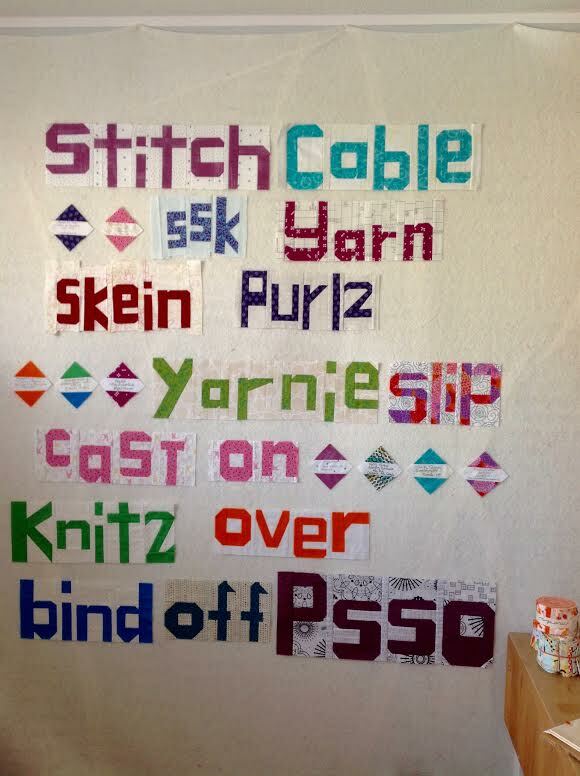 Carla, of Grace and Favor, recently opened a yarn shop in her town, and requested knitting terms. 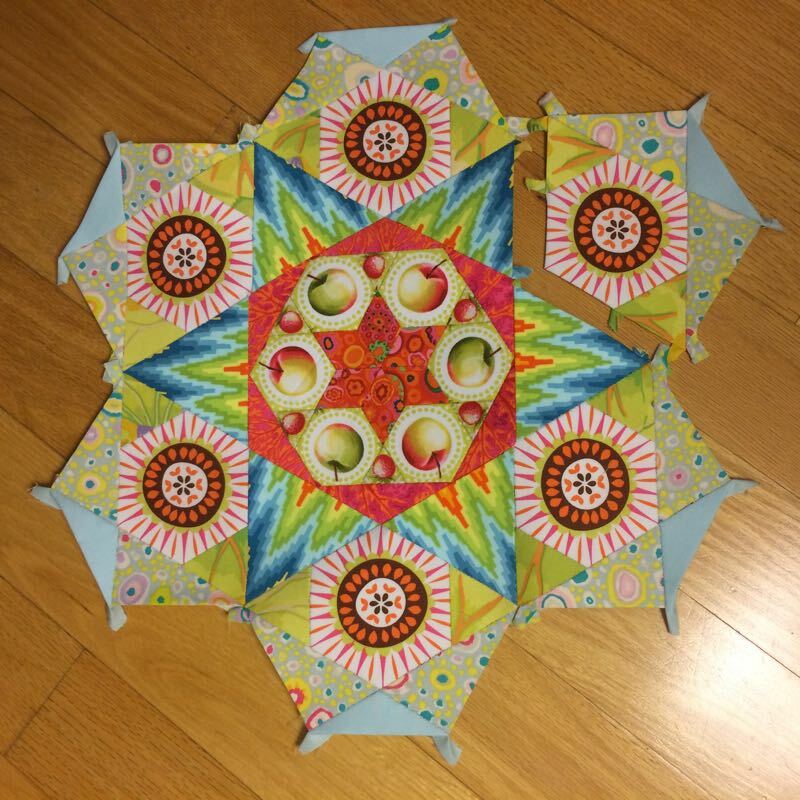 Susan finished her quilt the first, showing it off here and on her blog, PatchworknPlay. This truly typifies Susan’s attitude towards life! 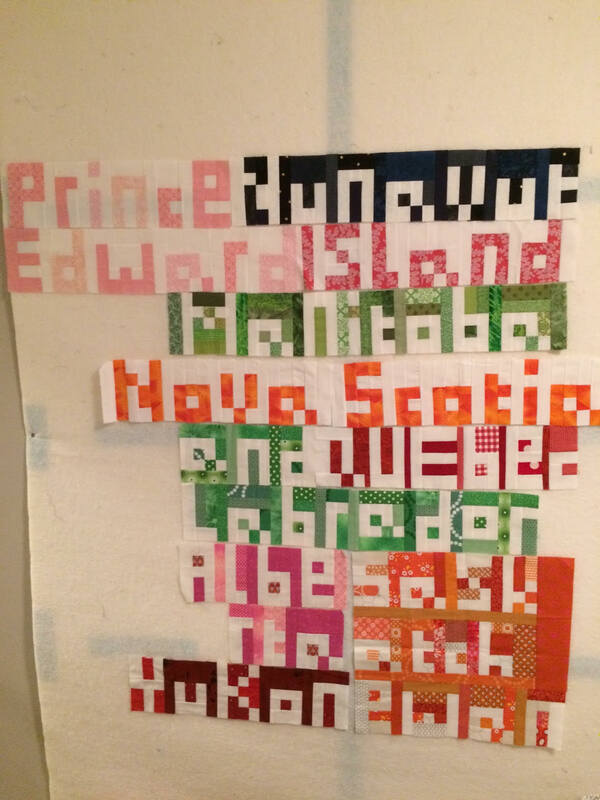 Just to keep us on our toes, Kerry of PennyDog Patchwork, decided she wanted us to try her “digital” alphabet, and we made up the names of the provinces of Canada, her new country. 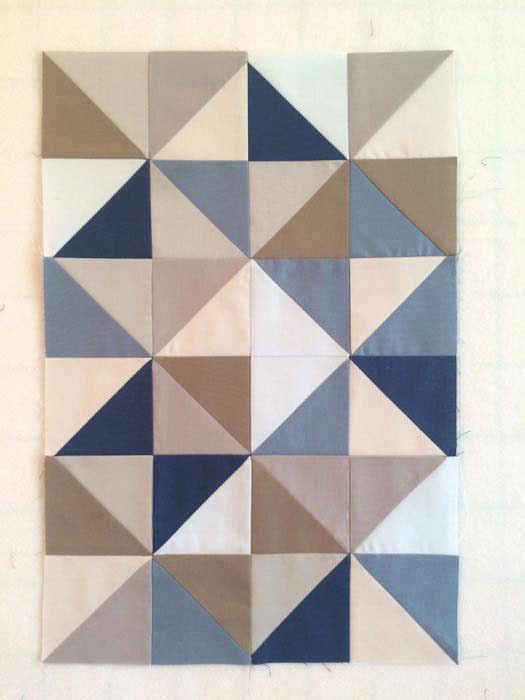 While the how-to’s for the regular alphabet are free on the blog Quilt Abecedary, this style is Kerry’s own. 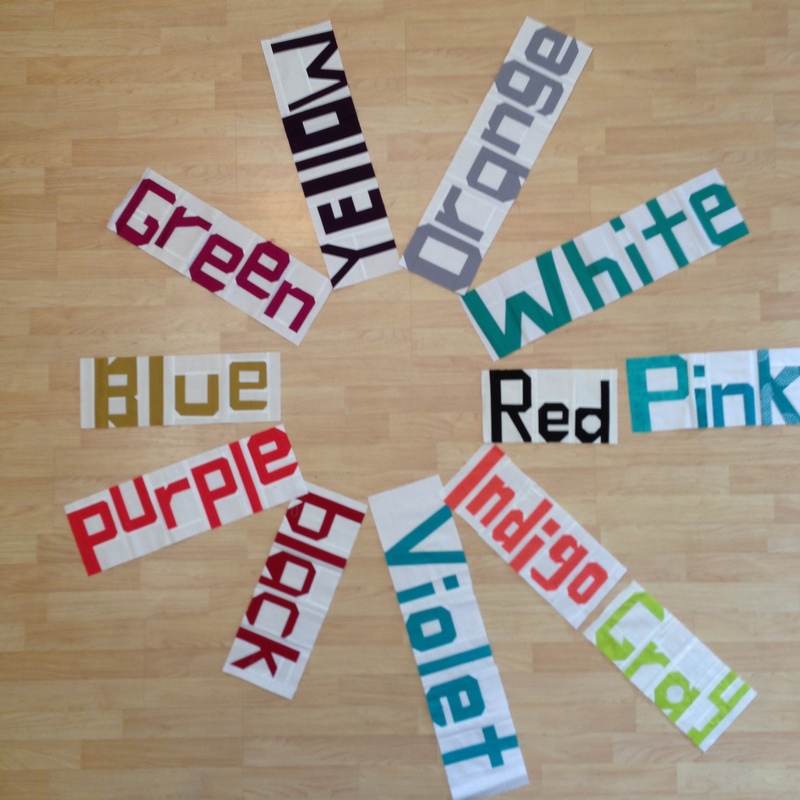 Simone, of Quiltalicious, tried to make us all go crazy by asking for color names, but in different shades. 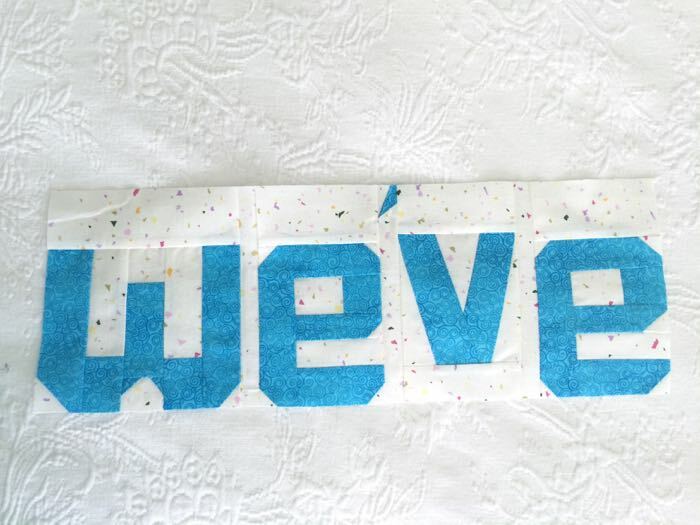 A couple of us dutifully cranked out our word, only to realize that we sewn it up in the wrong color. We were all getting pretty good at this point. 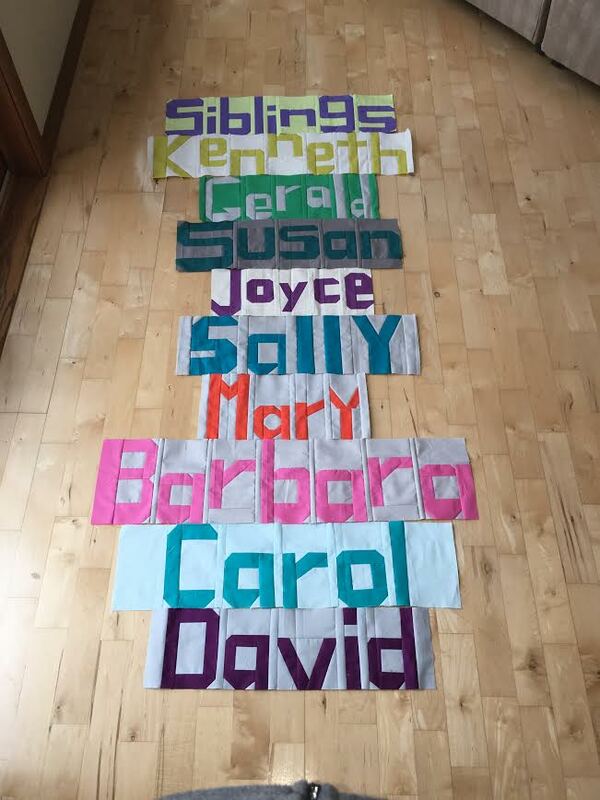 Mary (aka maryonlakepulaski on IG) wanted the names of her family. Since bee-keeping was a new passion for Rachel (The Life of Riley), we all sent bee-words to her. 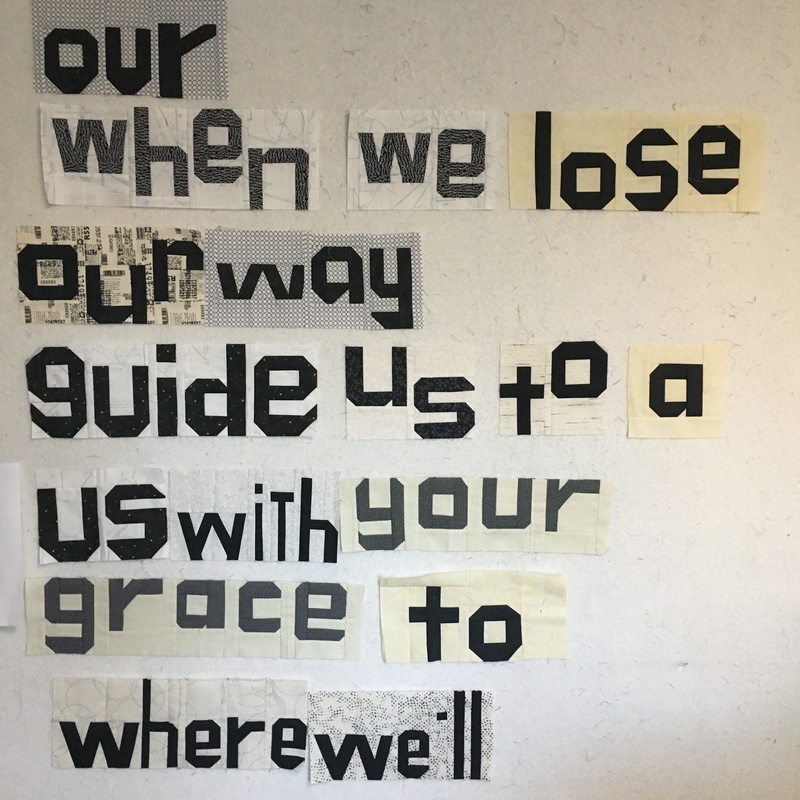 Cindy of LiveAColorfulLife, is doing the words to one of her favorite songs; unlike her name, she went with black, white, cream and grays to put together her phrase. Hope you’ve enjoyed this wrap-up of our word adventure! If you ever jump in and make a word or two, drop me a note as I’d love to see them. Coming soon: a new bee! 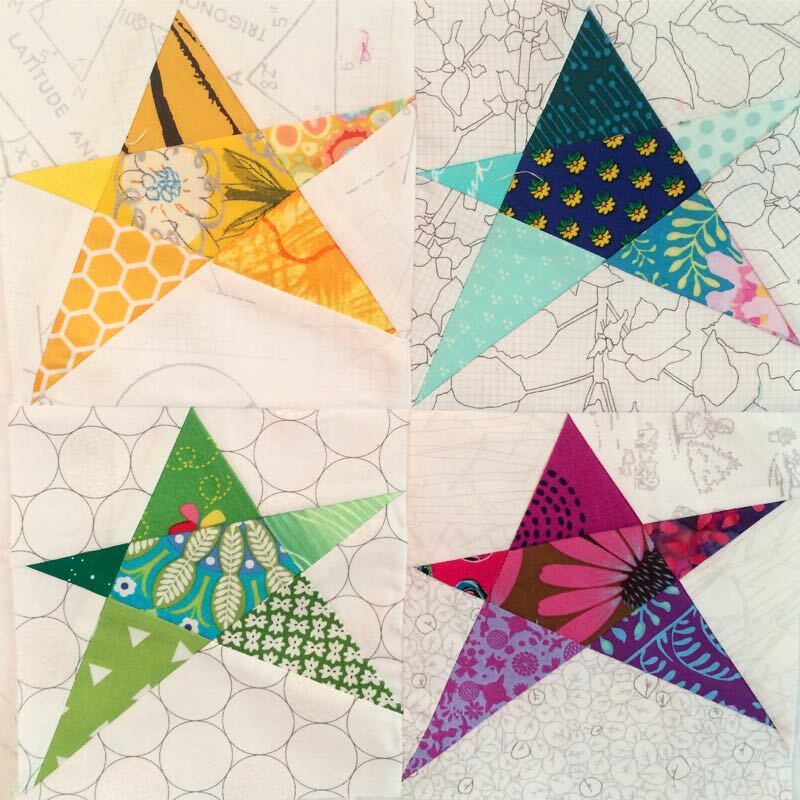 Posted on December 4, 2016 by Elizabeth E.
The Mid-Century Modern bee began four years ago, and I recently sewed the final blocks in Anna Maria Horner fabrics (as per the Queen Bee’s request). 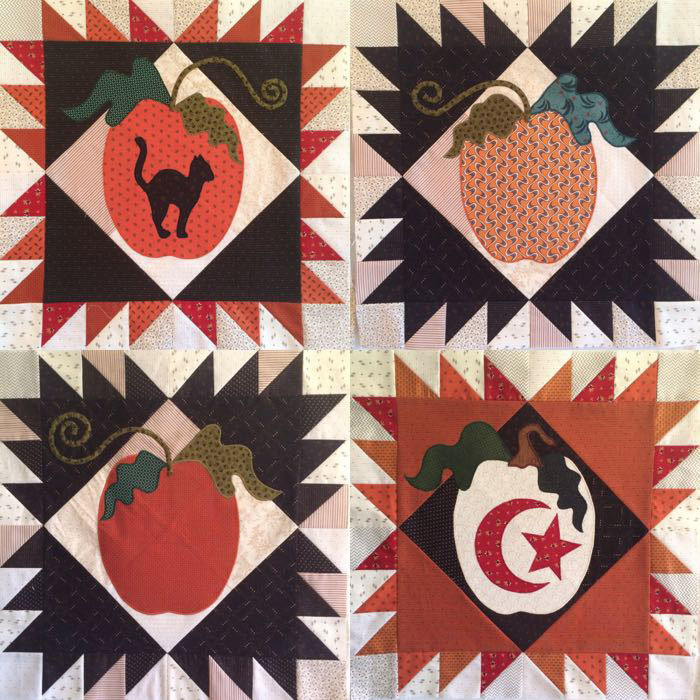 We were supposed to do the blocks we’d requested for her, but I didn’t think mine would translate, so I obtained permission to do these: some Chuck Nohara blocks, writ large. 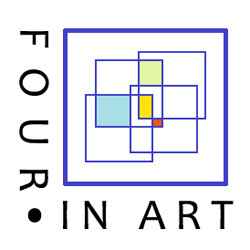 You’ve perhaps seen this logo, nestling down on the side of my blog for a while. Cindy (who had the idea for this bee) and I developed it one night while sitting side by side at this computer. I do think we collaborate well. And…that’s a wrap for The Spelling Bee, too, although some members are still cranking out their words. This bee ended officially November 30th, and I hope that everyone has their words by the end of the year. All of mine are above; because of the length of my verse, about half of them were made by my beemates, and I did the rest. 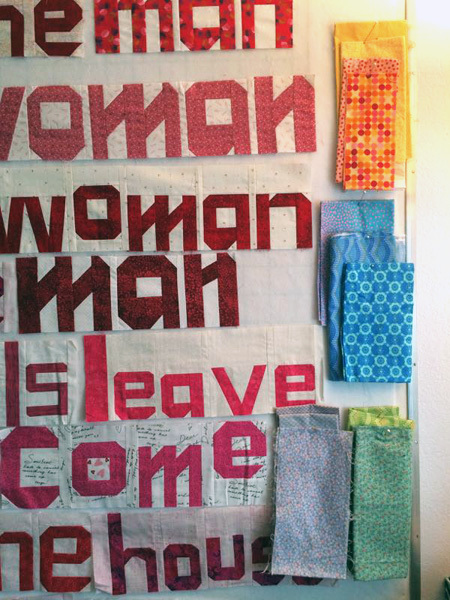 My original intent for my wordy quilt was to have it be done all creams and pinks and reds for a Valentine quilt, but as soon as I got it up, I realized it needed some color. On the side I pinned some fabrics to audition for the quilt, and I have some ideas. 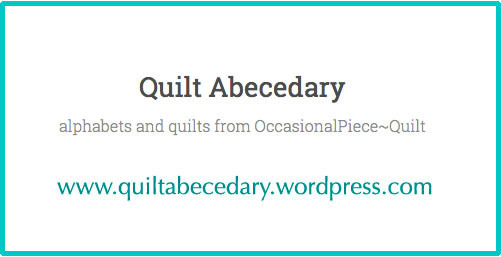 You can find a how-to for every letter over on the Quilt Abecedary Blog, which I wrote when I got in my mind to free-form create an alphabet. Have fun. I plan to do a year-end wrap-up of the two different bees, so then you’ll see what we’ve all been up to. I like doing bees as I’m exposed to new ideas and new blocks and a different way of looking at the world. 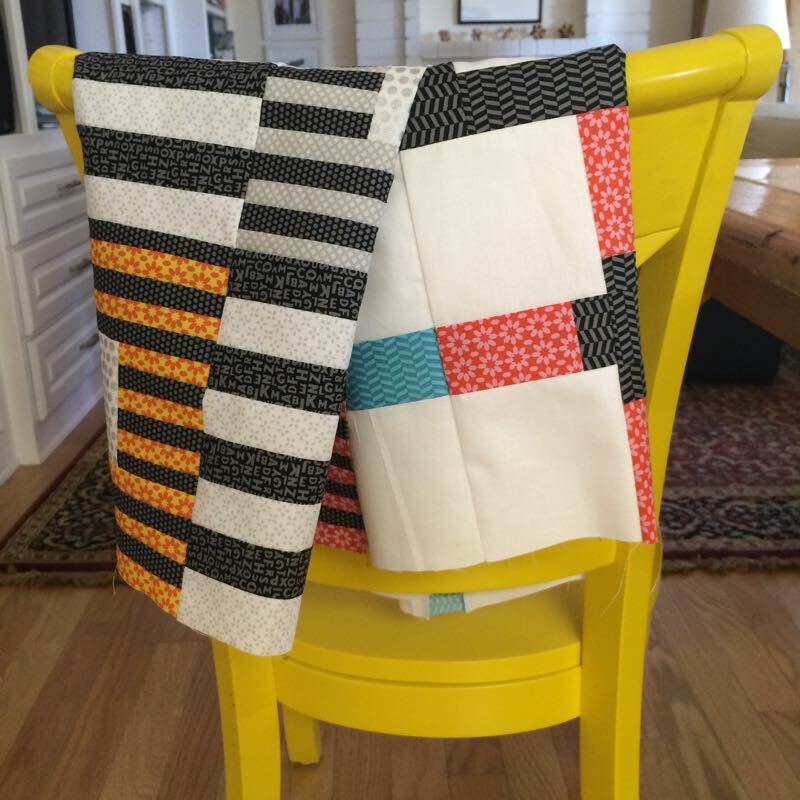 Who would have known that an enlarged Chuck Nohara block in AMH fabrics could look so fabulous? Now I do, thanks to my beemate. 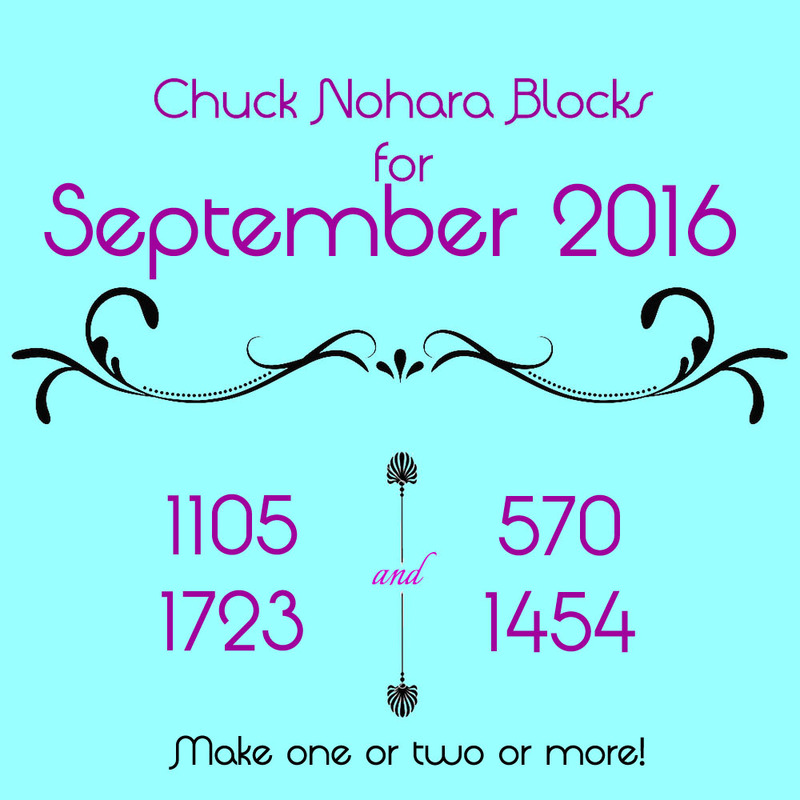 Posted on September 1, 2016 by Elizabeth E.
A new month begins with this. . .the list of the Chuck Nohara Blocks to work on. 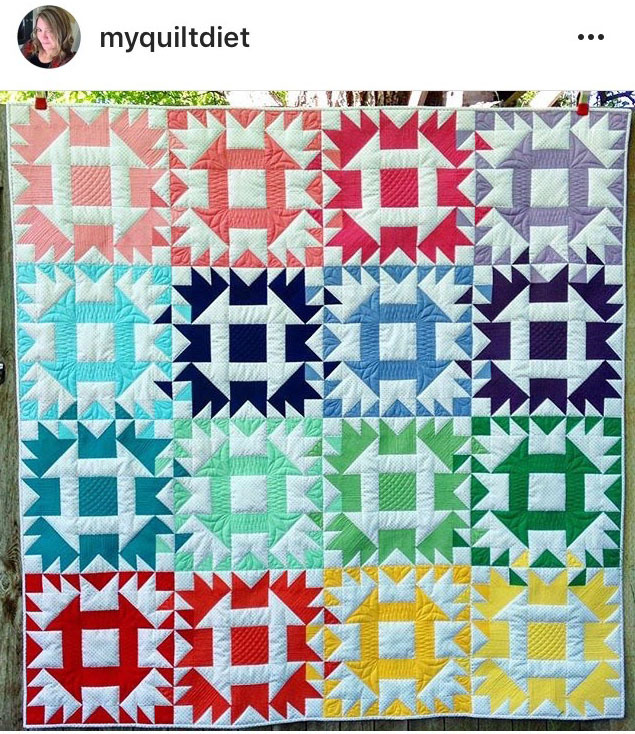 I finished up Mary‘s block and sent over to her. 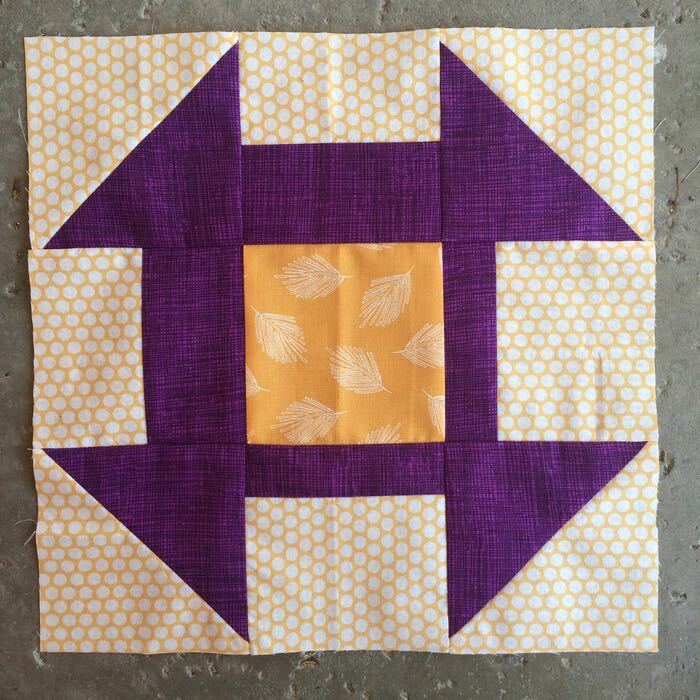 This 12″ block comes from a free paper-pieced pattern from Amy Friend of During Quiet Time, found *here. 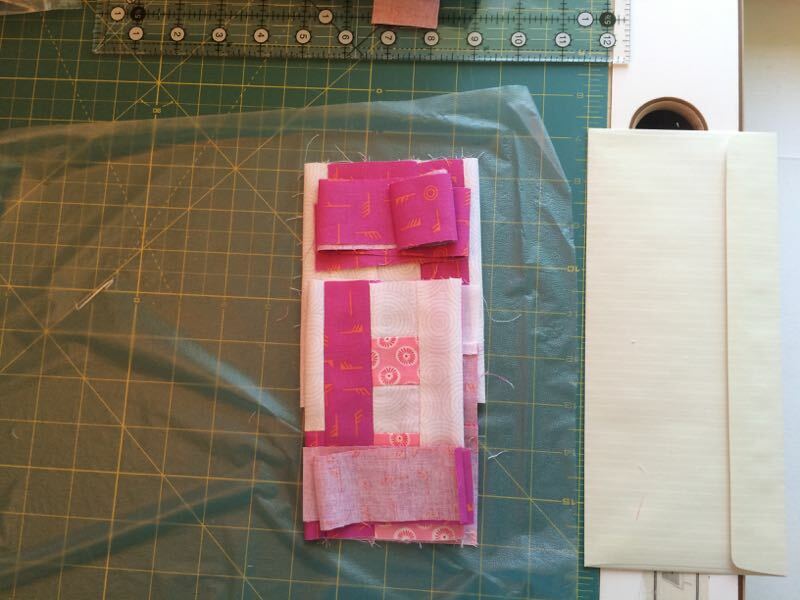 * While it took some time, and while I always seem to have to un-stitch (aka, rip out) some pieces because I put the fabric on backwards, it was not difficult. Our Spelling Bee is coming down the home stretch, with only three more months to go. In August it was also Mary’s turn, and she requested a series of names. 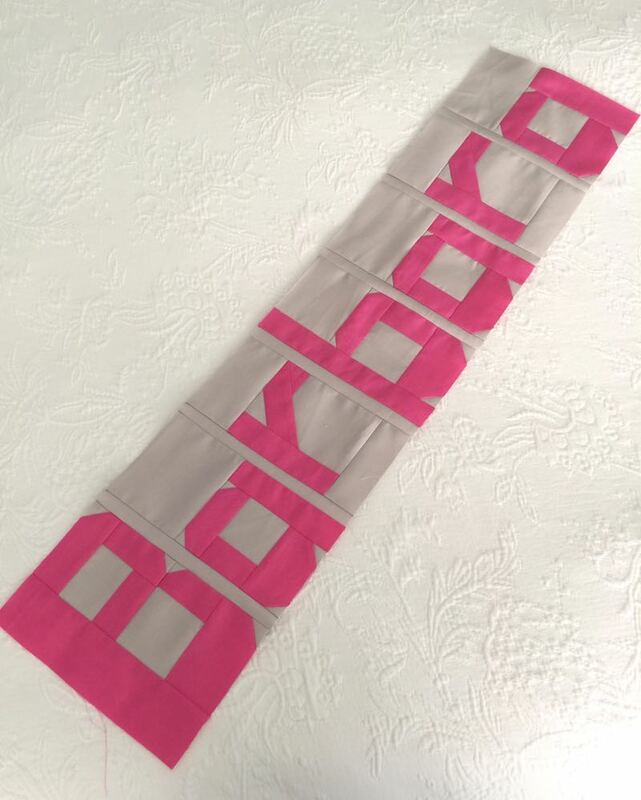 I chose Barbara, because that is my daughter’s name, too. 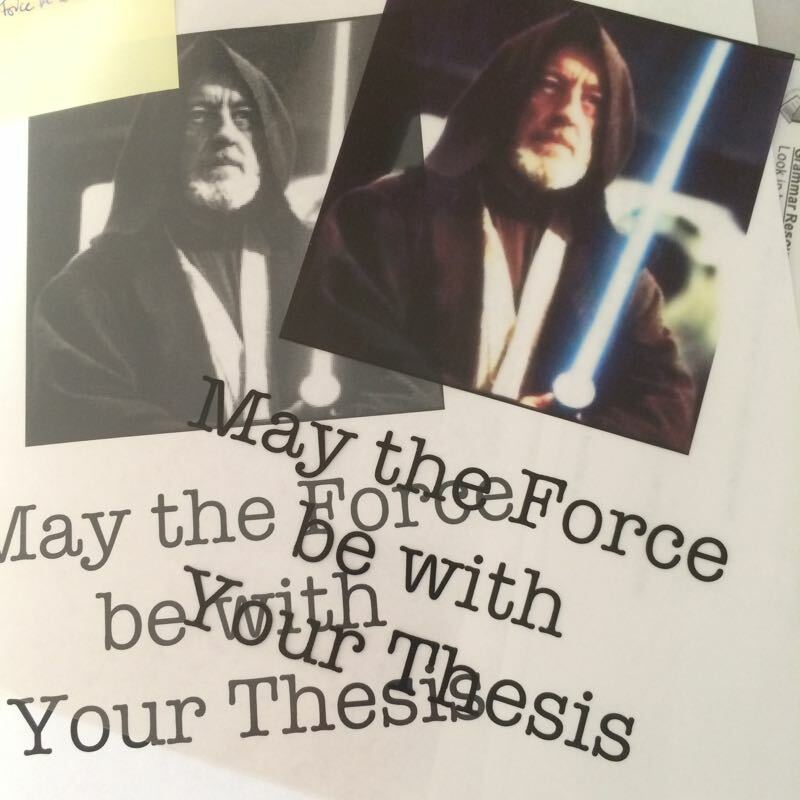 I started cleaning out some of my teaching stuff, since I retired this year. Yep, that life is over with. I even sent in my letter and they are working on transferring my sick leave (which, as an adjunct professor, was always kind of useless) to service hours towards my retirement (which again, as an adjunct professor, I don’t have). But there you go. 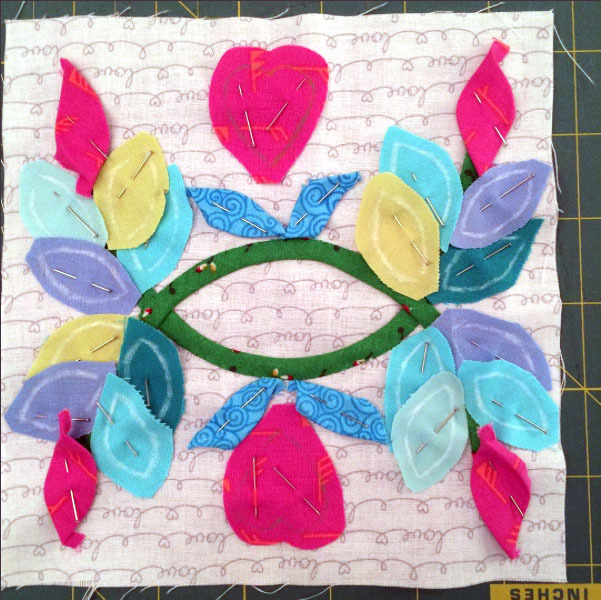 I taught a lovely group of women Free Motion Quilting this past Saturday, who boldly jumped into the waters of quilting. It was a great class, shown here holding up their samples. 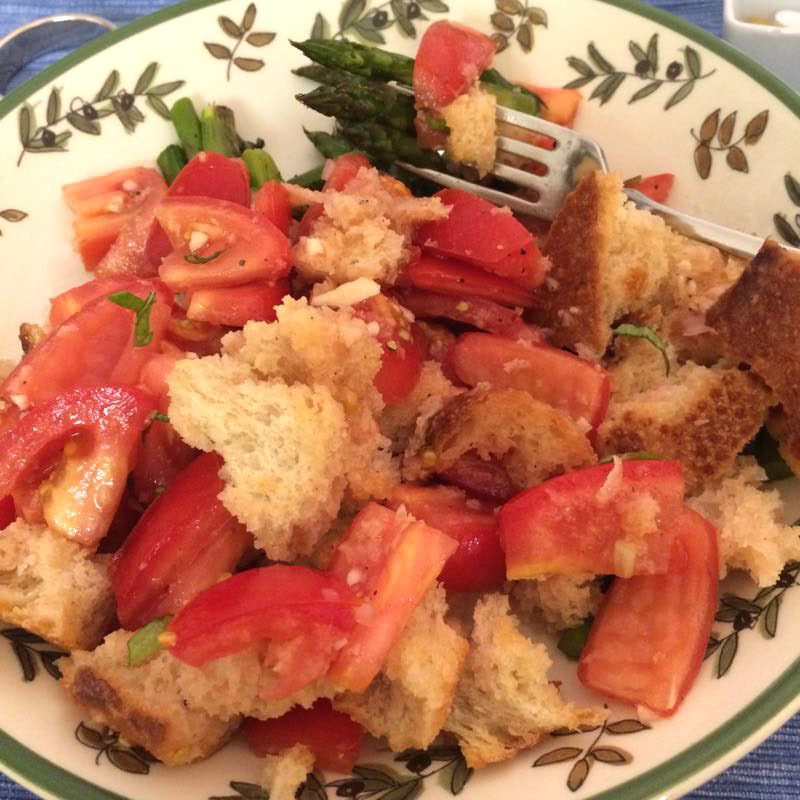 I found a new recipe for Panzanella, that delicious dish you make with toasted ripped bread, fresh tomatoes and a whole bunch of summer. It’s on my recipe blog *here. 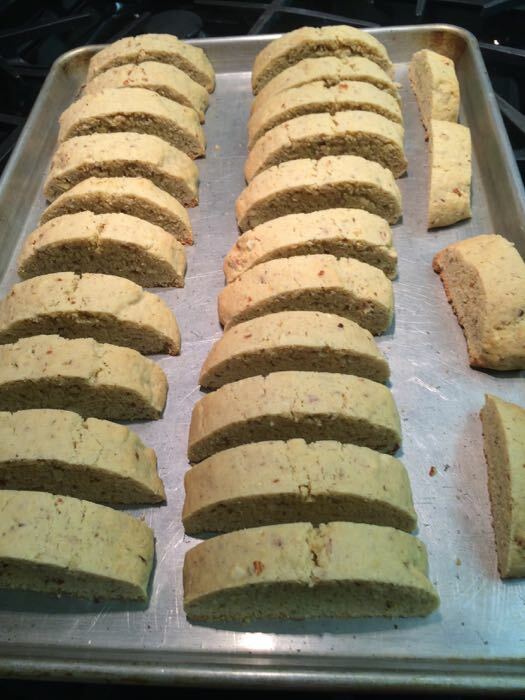 * I started keeping my recipes on a blog, as I’m always downstairs and the recipe is upstairs, so now I can have these favorites wherever I go. 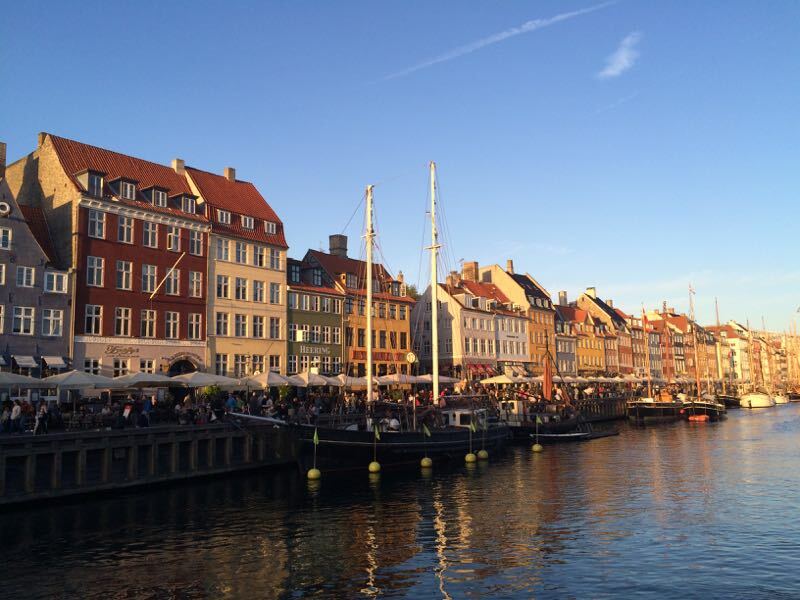 We traveled to Copenhagen, Denmark (that’s Nyhavn you see above) and Stockholm, Sweden. 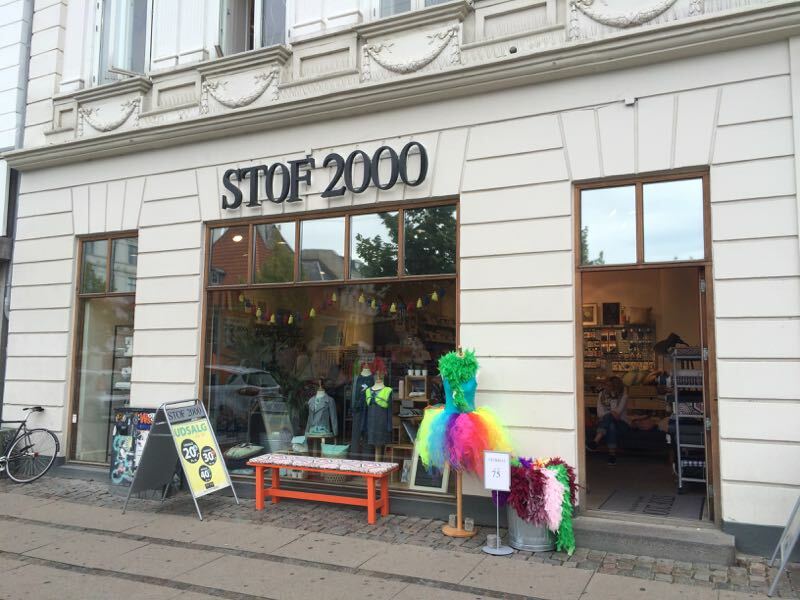 This time, unbelievably, I only went to ONE fabric shop, Stof 2000, in Copenhagen. 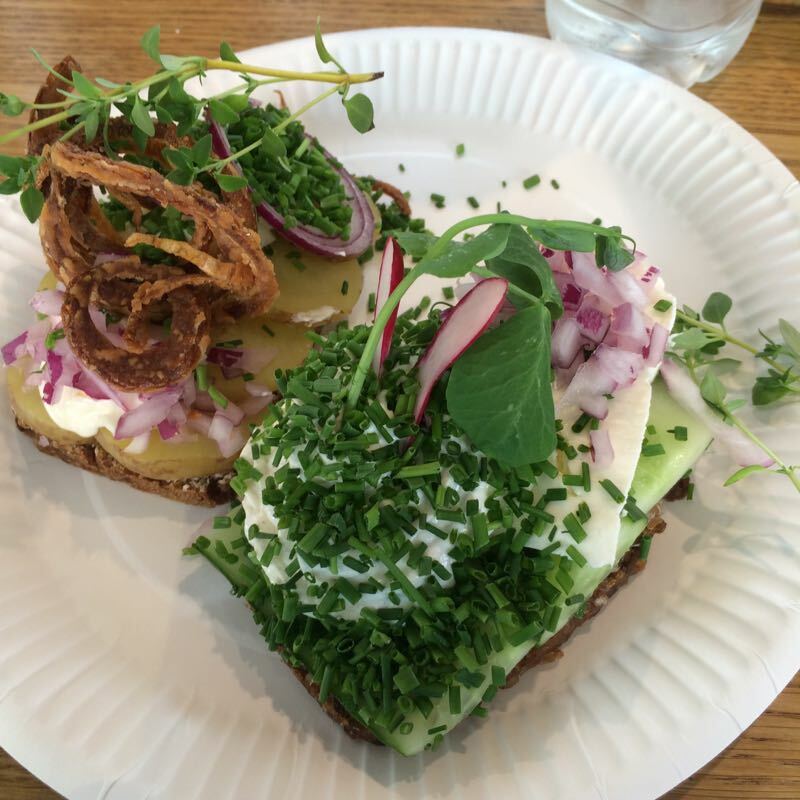 And I ate some of their smorrebrod, deliciously stacked sandwiches atop thin slices of rye bread. Oh, and maybe a little bit of this. I’d send you all some but we’re expected to be nearly 100 degrees today–actually a cooling trend from this week’s Last-Week-Of-August-Weather. 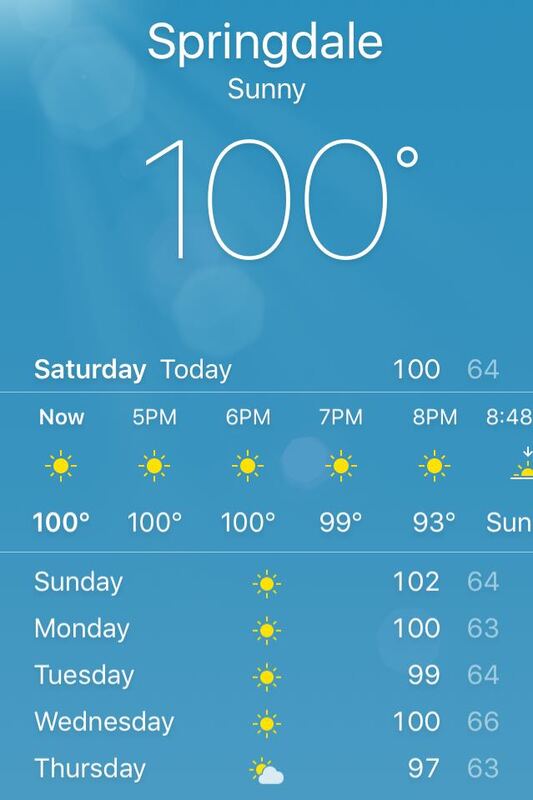 And that is another reason why I’m welcoming in September with open arms: it should start to cool down. Happy News. . . Happy September! 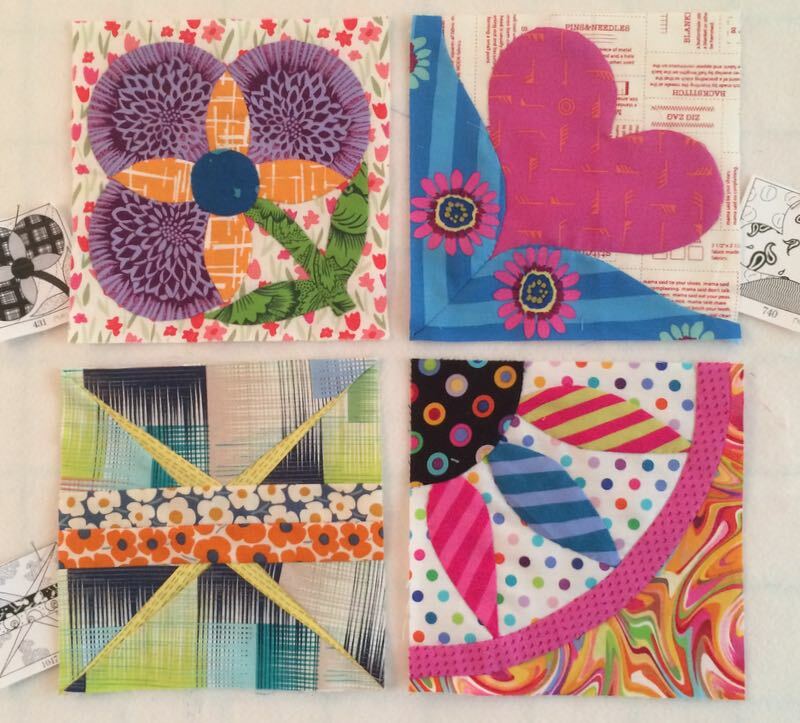 Posted on June 29, 2016 by Elizabeth E.
Well, I’ve finished three of the four June blocks. 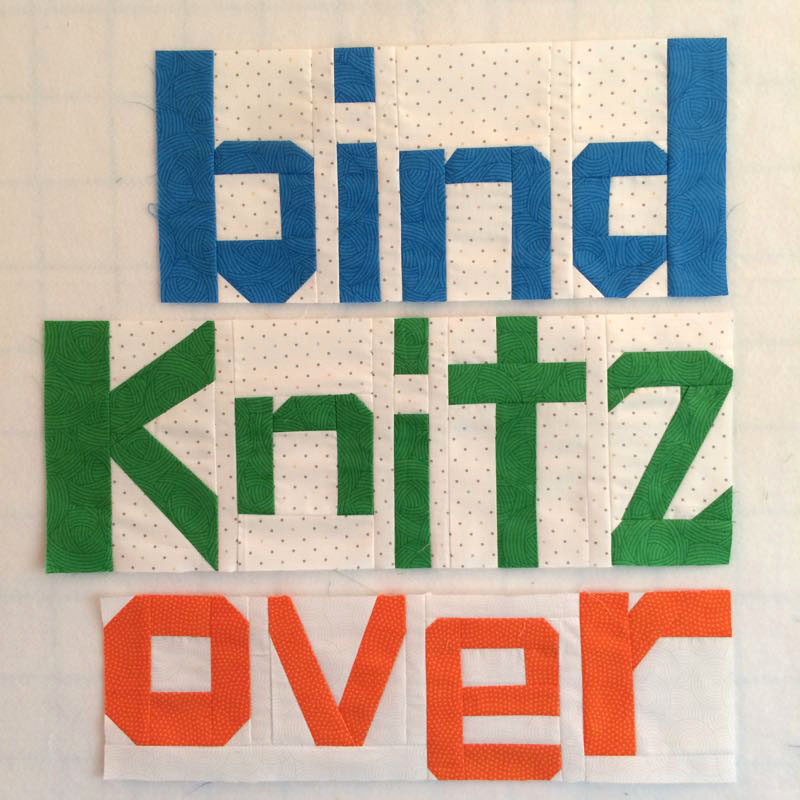 The last block won’t be finished until July, because I lost my mind and chose something that is insanely complicated. My block buddies, Susan and Betty didn’t complain at all, even though when they saw it, they must have known I was nuts. That happens sometimes. 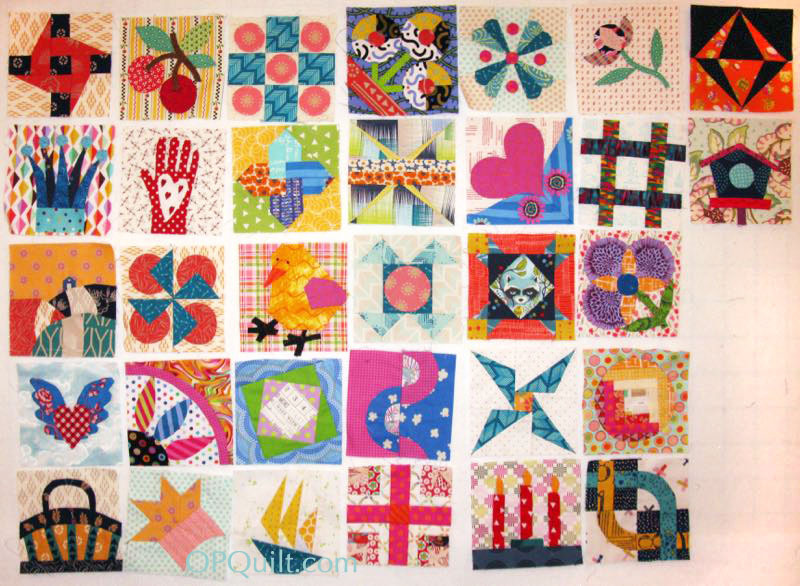 Here’s all the blocks so far: thirty-two fun little six-inch squares. Susan chose the heart-in-the-hand block and I love it. 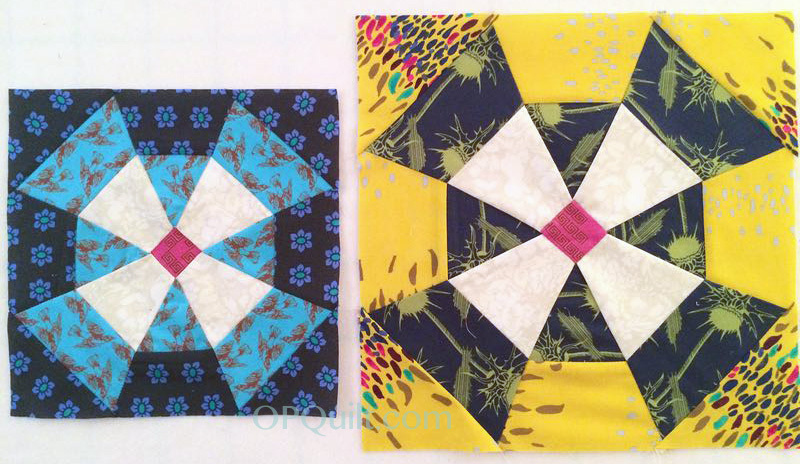 I was busy the last couple of days making these two small quilts. 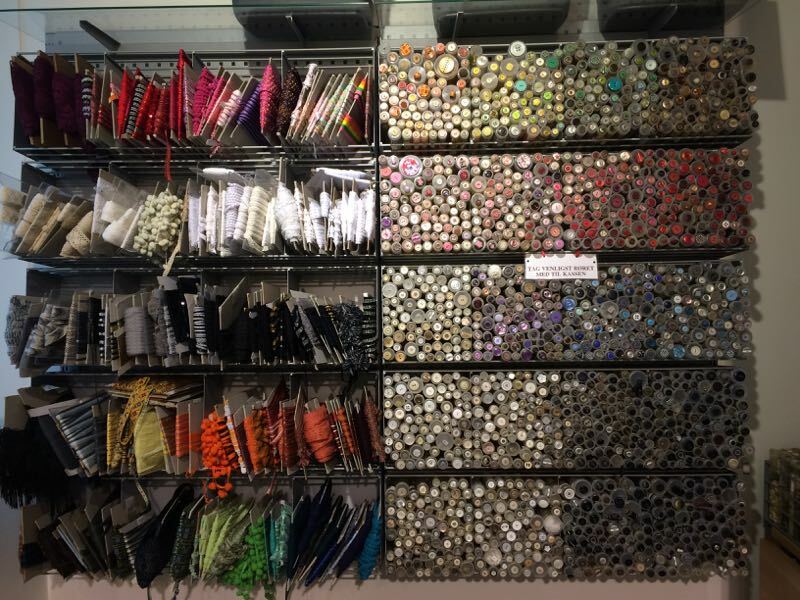 They are a combination of masterful creative ideas and talents from Kevin Umaña, and Janine Vangool’s Uppercase fabrics. I have a post planned next Tuesday showing them off. 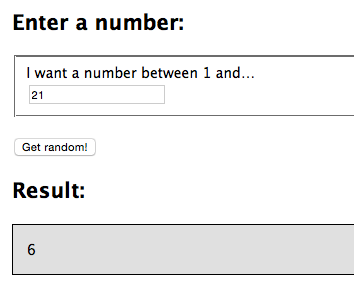 I even have a giveaway, courtesy of Ms. Vangool. I’ve also been busy finished the stitching on our Oh Christmas Tree Quilt, which will post on Saturday with the first of the borders — the troublesome red-triangle border. All secrets are revealed that day (and yes, there’s a giveaway that day, too. These are getting out of hand, I think). . . Here is the re-do. She made up her own pixelated alphabet, not using the one the rest of us are (that one is on Quilt Abecedary, if you want it), but the word went together pretty quickly. 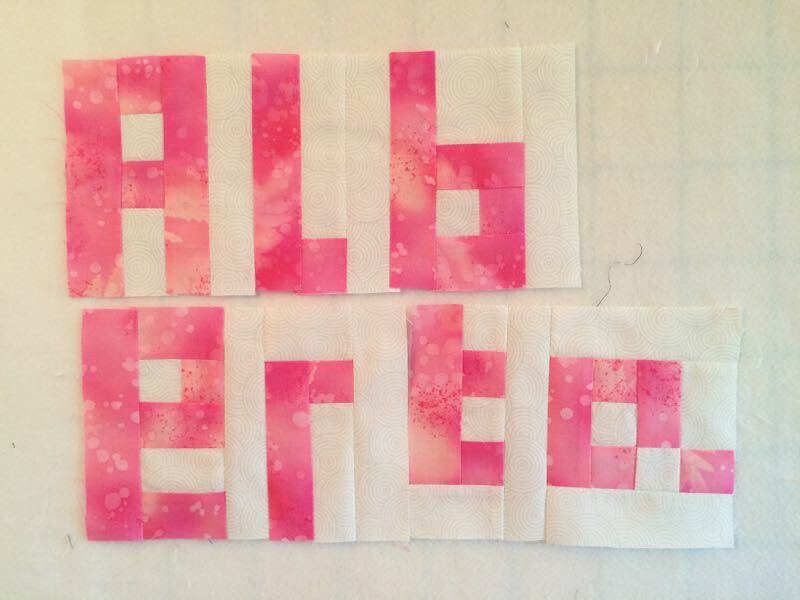 I do think this version of the word “Alberta” is easier to read than my first one, so yay. 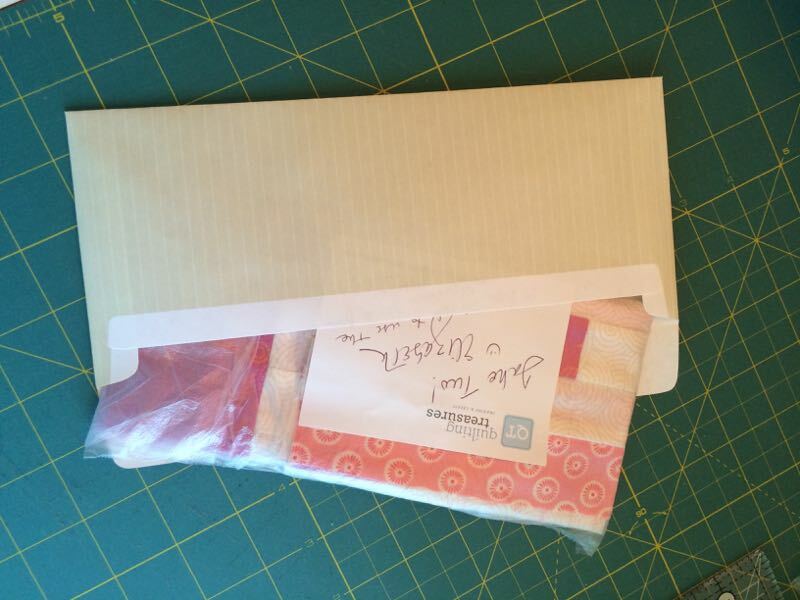 I’ve perfected my mailing to Canada: buy some Press N’ Seal, that sticky plastic wrap, and tear off a square. 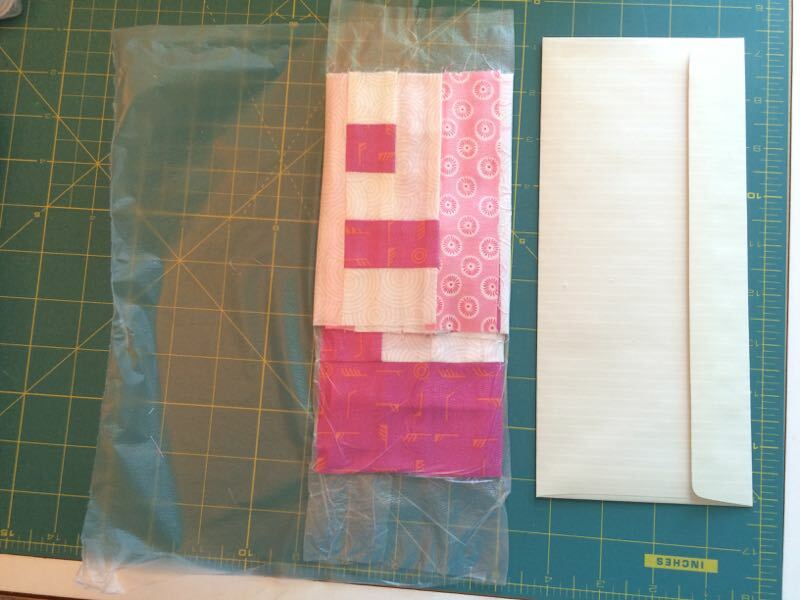 Fold your stuff-to-mail (just about one block only) the shape of your envelope. Fold over one side, and smooth the heck out of it. Make it really flat. 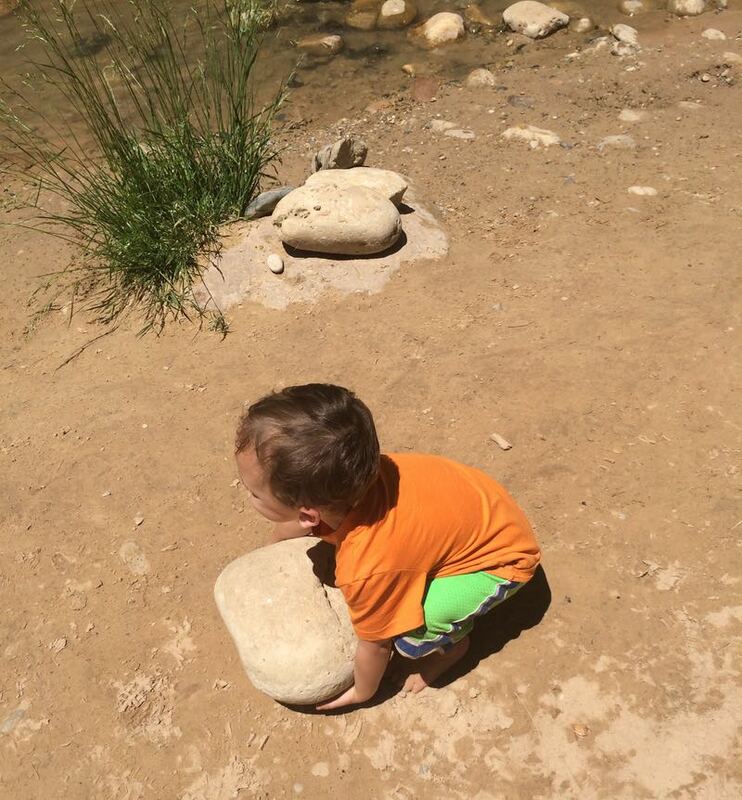 Then smash it some more, scooting all the air bubbles out to the side. Fold it again and again, smooshing after each fold. Squish squish squish out all the air bubbles and make it as flat as possible. Slide into your envelope and mail. I can send it from the US for a little over a buck. I’ll be taking a class with Gwen Marston on Friday, and can’t believe it. I tried to get into her classes at QuiltCon Pasadena, but they were all sold out even before I could get the log-in code to work. 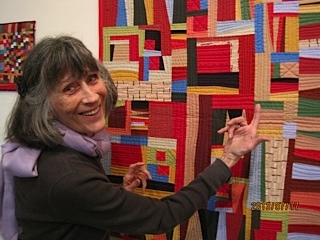 Since she’s retiring in 2017, I feel really fortunate to slide into one of her last classes, held in conjunction with the Seven Sisters Quilt Show. Posted on June 5, 2016 by Elizabeth E.
Because my husband is busy this afternoon recovering from our trip (see below), I used an online generator to pick a winner today for the felt, and it’s Elizabeth (what a great name, eh?) 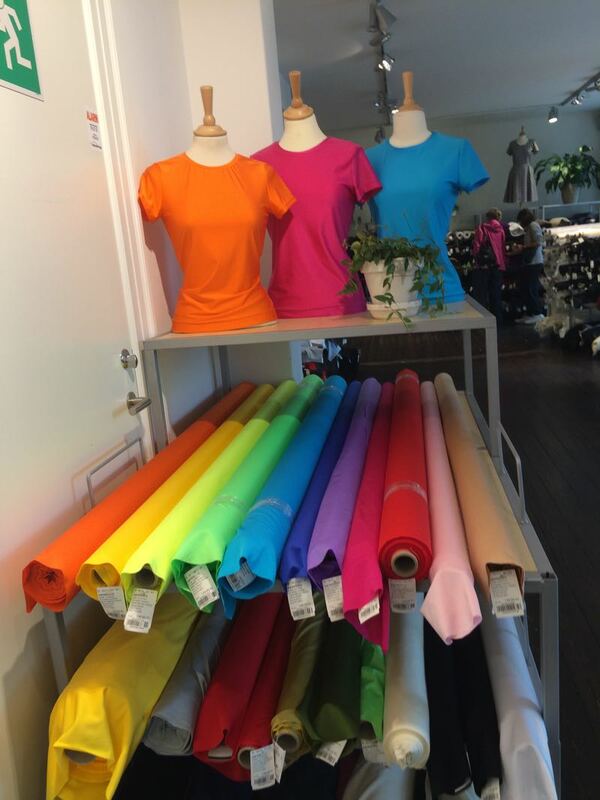 who goes by catskillquilter. Congratulations, Elizabeth! I’ll be in touch to get that sent out to you. 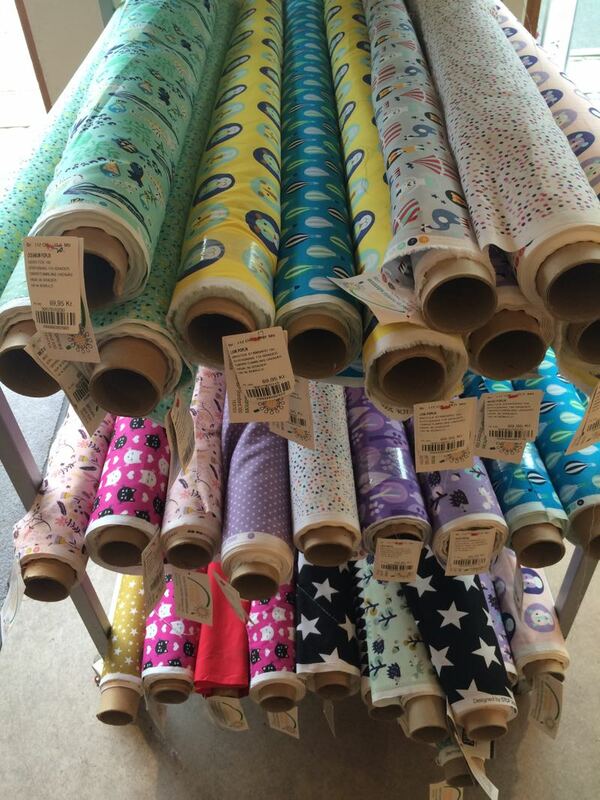 I have two more giveaways lined up in the next couple of weeks, one courtesy of Uppercase Magazine, and the other from the Steam A Seam people (that one’s on June 13th–in conjunction with our continuing Hallowe’en 1904 QAL). I’ll have some great news as well about that fabulous pattern. I thought it would be fun to try, but Carla said “Too much work!” I could hear the laugh in her voice, so I smiled and went with tweaking the center bars to give it a bit of a twist. I hope she likes it. 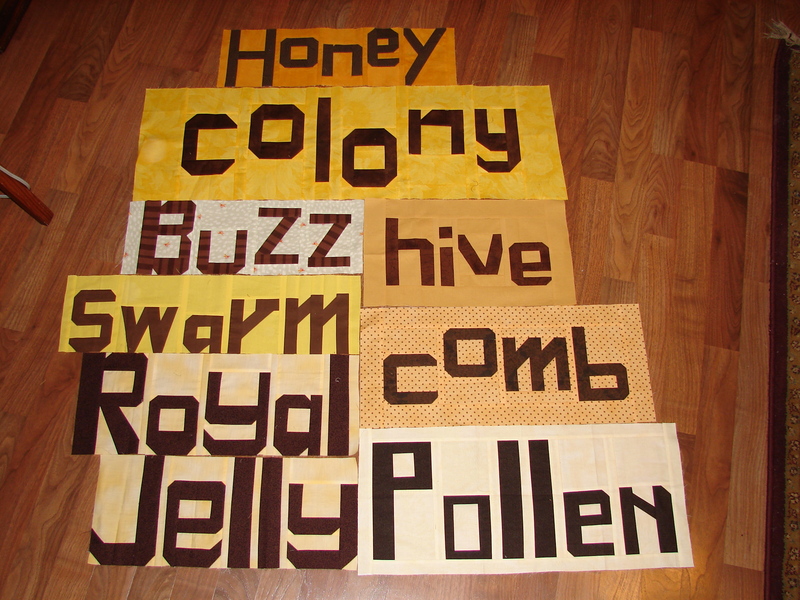 In our Spelling Bee Quilt Bee, Susan of PatchworknPlay asked for words to make up her saying, which she’ll reveal on her blog. I first took three words with “w’s” but then Simone had none, so I gave two back, leaving me with the above. 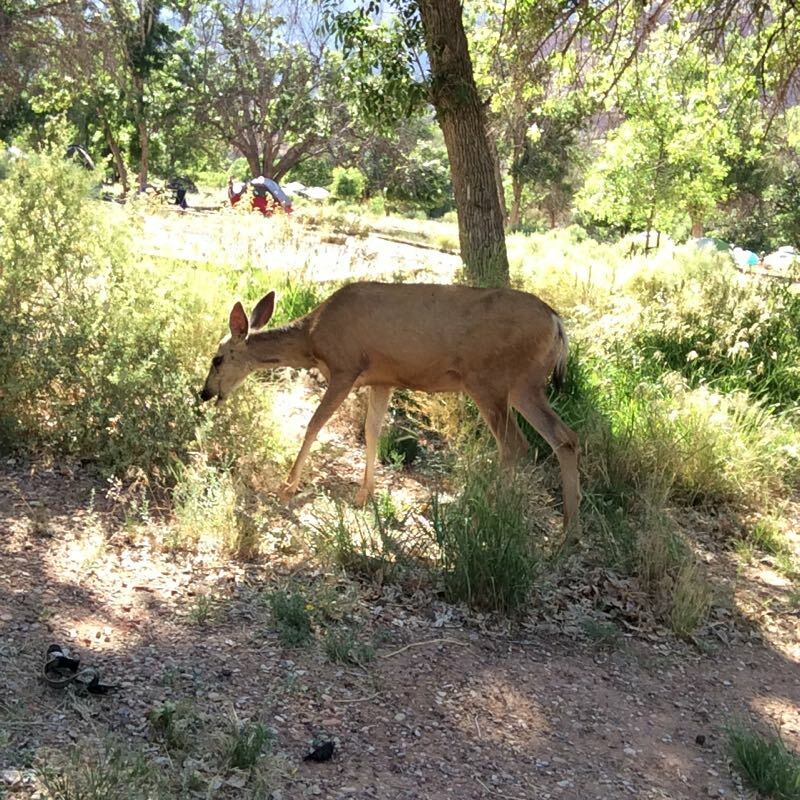 Since NOT staying at home seems to be the thing I do the best lately, we headed out Friday for a mini-reunion with my husband’s family in Zion National Park, about 7 hours away. 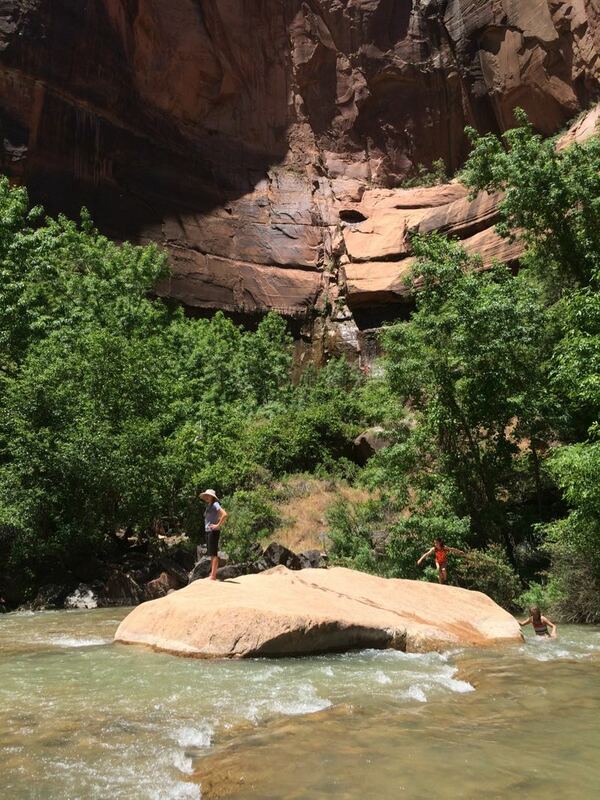 You can tell who has been coming there for ages (this makes about trip #20 for me) as we say “heading to Zion’s” as if there’s a possessive element there. (However, I do feel like it’s “my” park.) 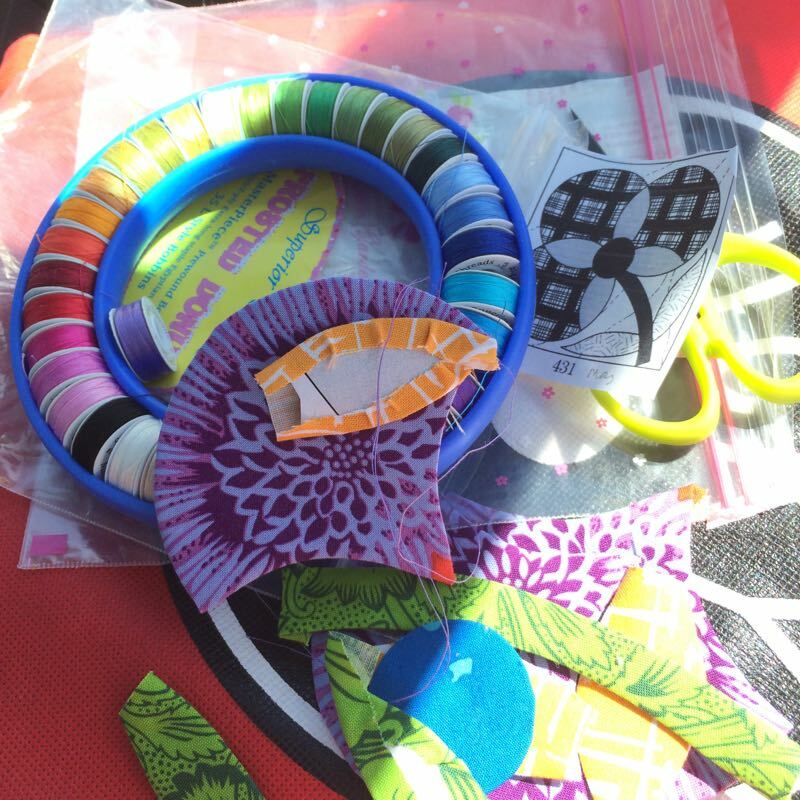 To try and catch up with my patchwork, I took some Chuck Nohara blocks on the road, stitching them in the car and in the park. We invested in new air mattresses this year, twin blow-up beds, and those of you who have slept on a queen air mattress with another person while it slowly deflates all night long, know exactly why I replaced our aging air mattress. 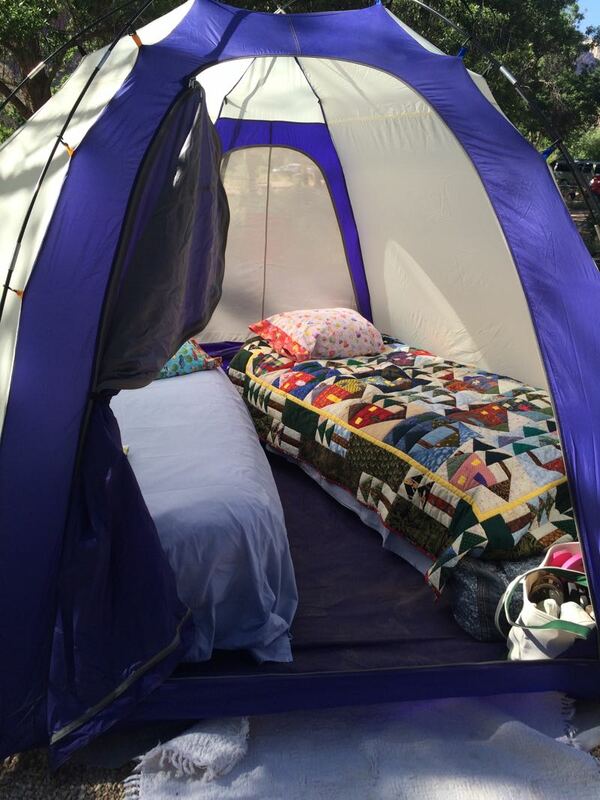 It also helps that my favorite camp quilt, Hearts in the Pines, is made for a twin. 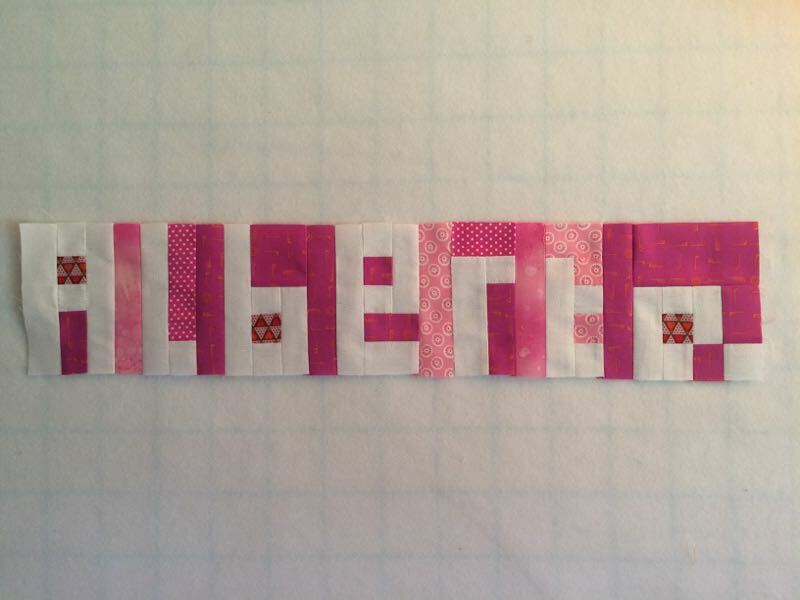 The pattern is out of print, but you can find the blocks in this previous post. My husband’s bed later on got a green nine-patch, but he left it off because it was. 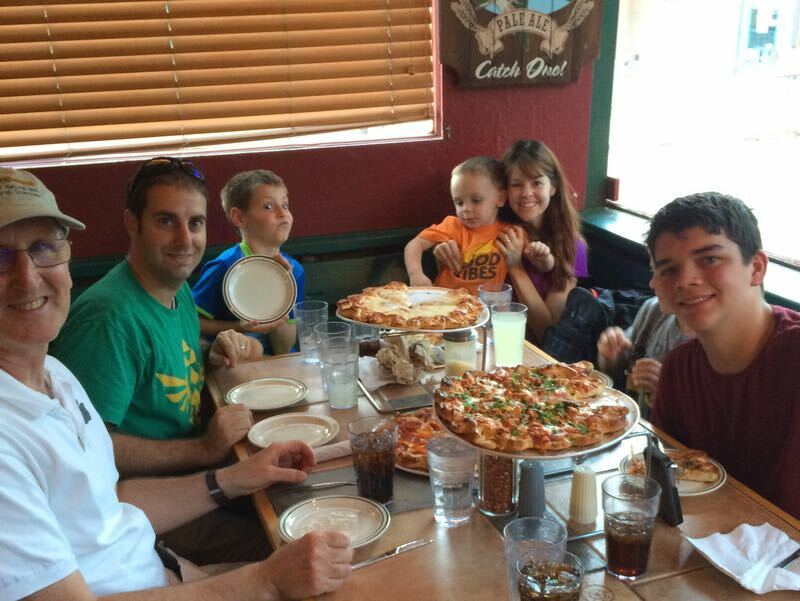 . .
My husband and I, my son and his wife and boys always go out to dinner at Zion Pizza and Noodle Company the first night, as we all love their pizzas, and who wants to cook after setting up camp? I love their scallopy crusts. 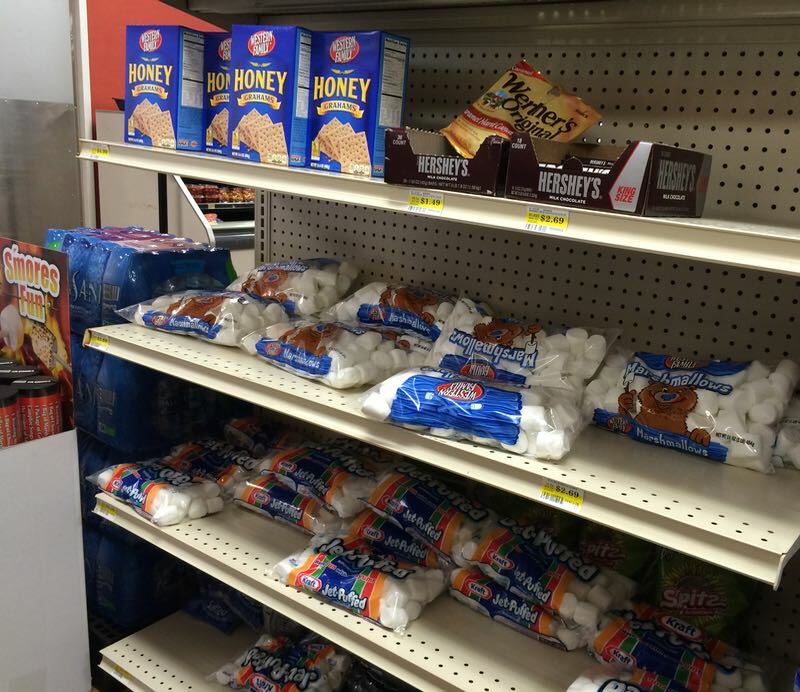 We were tasked with getting the S’more supplies. I cracked up when I saw a whole section just dedicated to this. 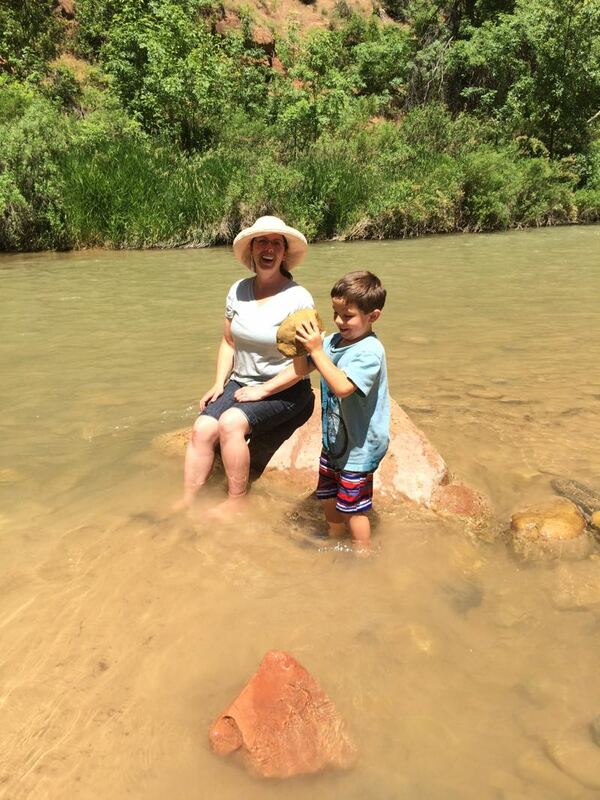 We rejoiced to have my husband’s niece (shown here in the Virgin River with the youngest of her six children) join us. Several weeks ago she underwent surgery for a brain tumor, and while under anesthesia, had a stroke. She awoke to a mostly paralyzed left side and has undergone significant physical therapy just to be able to walk with occasional hesitation. But she’s walking! She’s our own little success story, and she and her husband and family are our very own heroes. Now to head into June! 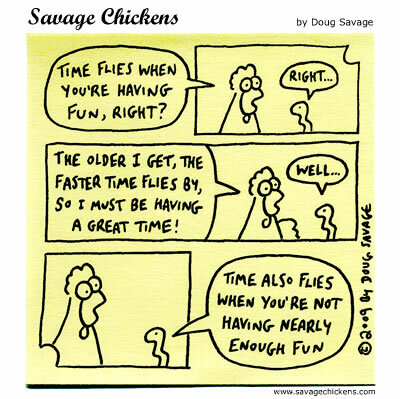 Posted on April 28, 2016 by Elizabeth E.
Or as my friend used to say, “Time flies whether you are having fun or not.” So what have I been doing? Blocks for our Spelling Bee for Carla, who has just opening a knitting shop. I made two and then one more for Simone, whose daughter is getting married and she’s making the wedding dress. She gets a pass, I’d say. I made bee blocks for Mid-Century Modern Bee, for Stephanie, who doesn’t really run a blog, but is here on Instagram. Actually she’s in Russia, but try not to hate her. It looks like a fabulous trip. Did (what I call) Duty Sewing to make an item for the Scout Auction at our church. I was thinking Scouts=Food, so I picked up four boxes of treats at Trader Joe’s, a Dairy Queen gift card and two shopping bags, and wrapped them all up fancy. 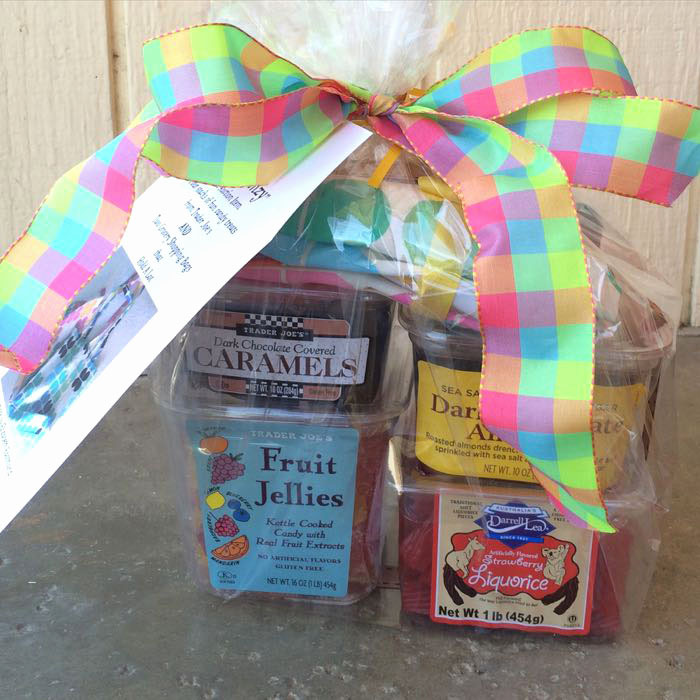 It’s to help raise money to send boys to camp. I used to be in the boat of forking over moolah for Scout camp (I had three boys), and am really really happy to be at this end: donating, rather than doing. 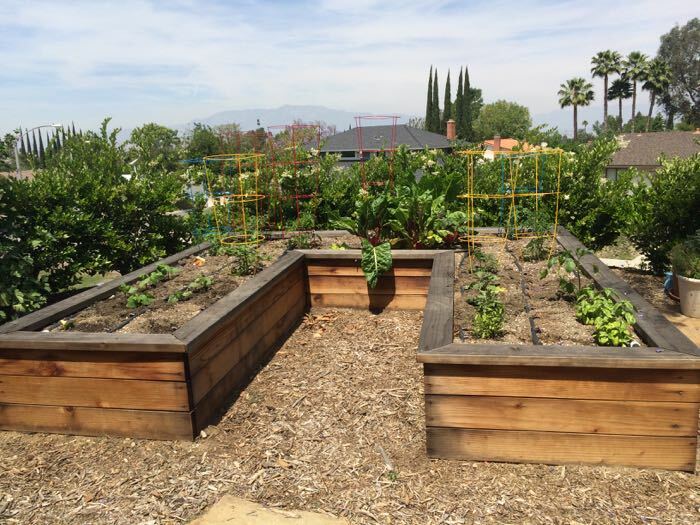 Planted my summer garden. This time we didn’t buy the fancy-schmancy tomatoes at the Swanky Garden Center, but instead went to the local nursery and Lowe’s. They look much healthier. Things that grow in my garden are an endless fascination to me, and I sometimes check the seedlings daily. I’m #goofyaboutmygarden, thank you very much. 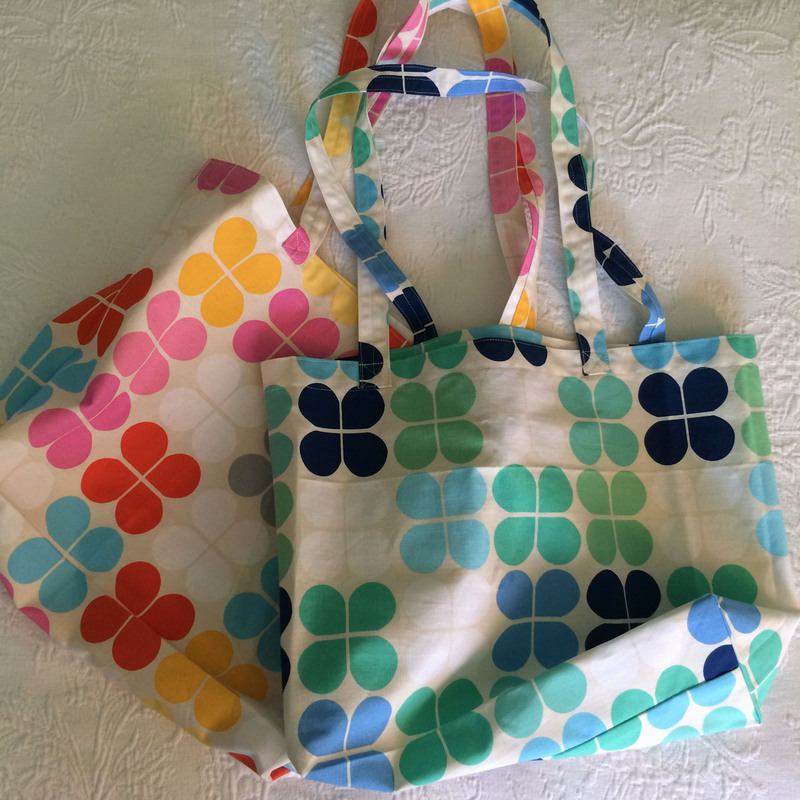 Did some market sewing for a friend. 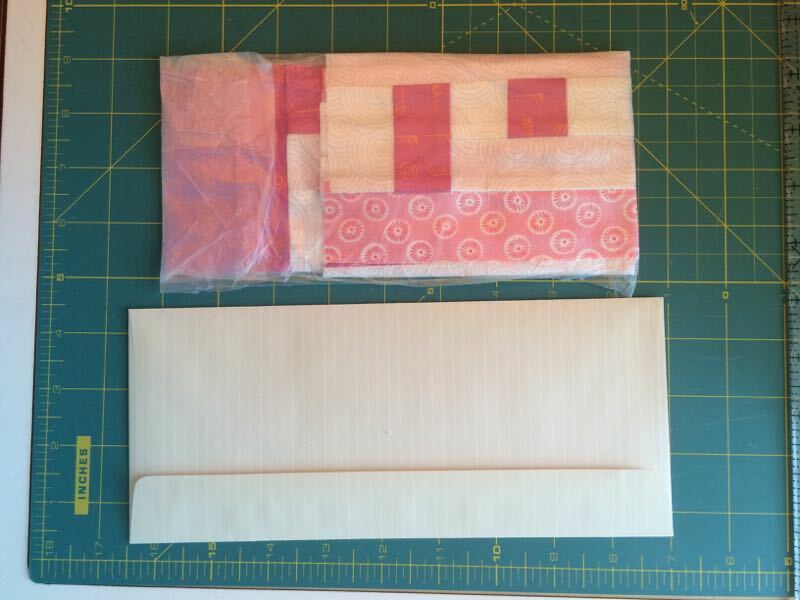 I also made plans to go to market, courtesy of Painter’s Palette Fabrics, who I sewed a quilt top for. . . and now I get to see it! Can’t wait–so excited. Perused Instagram. 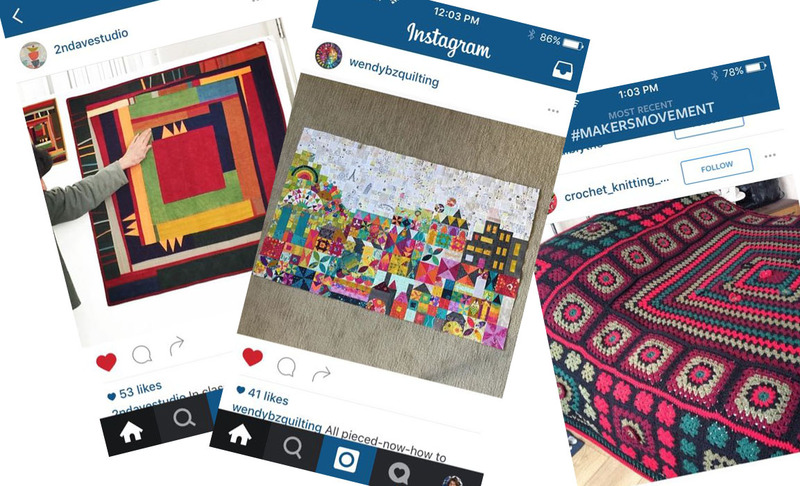 I had no idea that people still crocheted granny square bedspreads. My horizons are widened every time I follow a hashtag that’s new to me, in this case #makersmovement, which is for (duh) people that make things. We used to be called crafters. I like the term Makers much better. 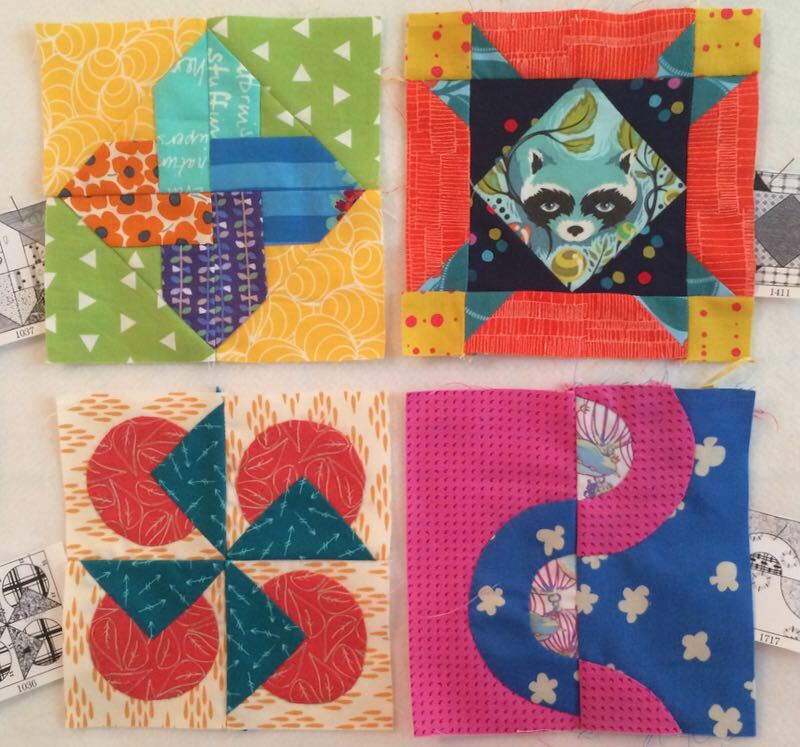 Finished up last month’s blocks for the Halloween QAL and got the blocks ready for this month’s post on May 13th. 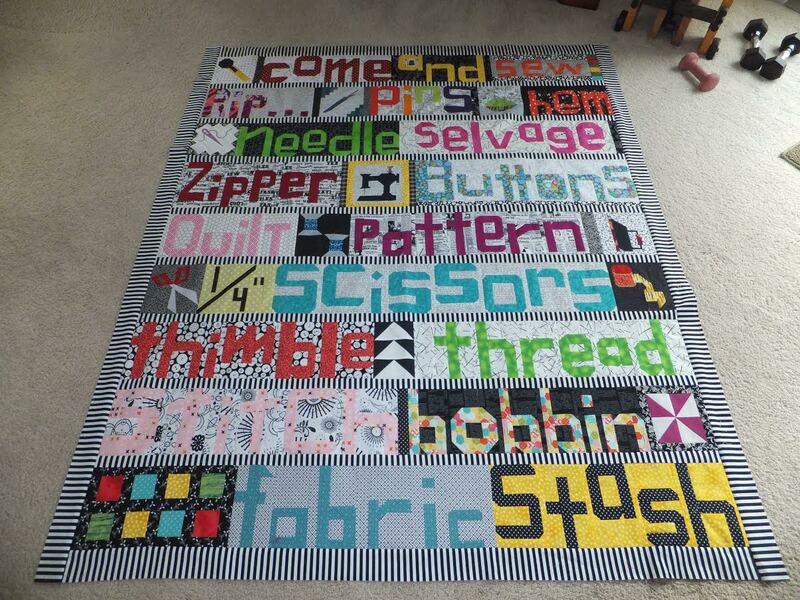 You know, when you break down a quilt into chunks, it’s much easier. 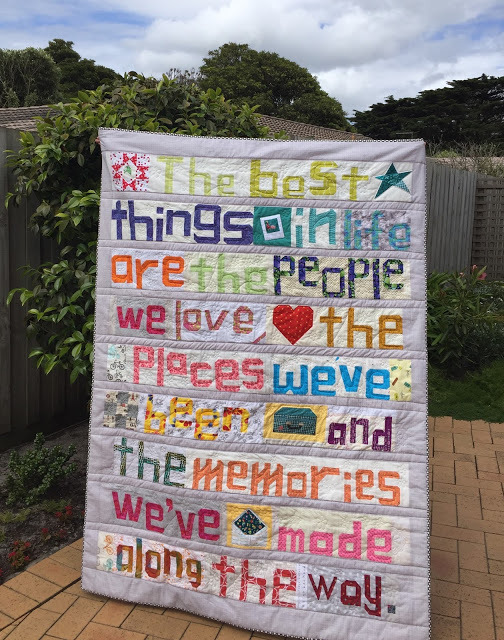 And I know I would have never have gotten this far, if it hadn’t been for the fact that I had to make the bits of the quilts to post. Thank you very much for putting up with me. 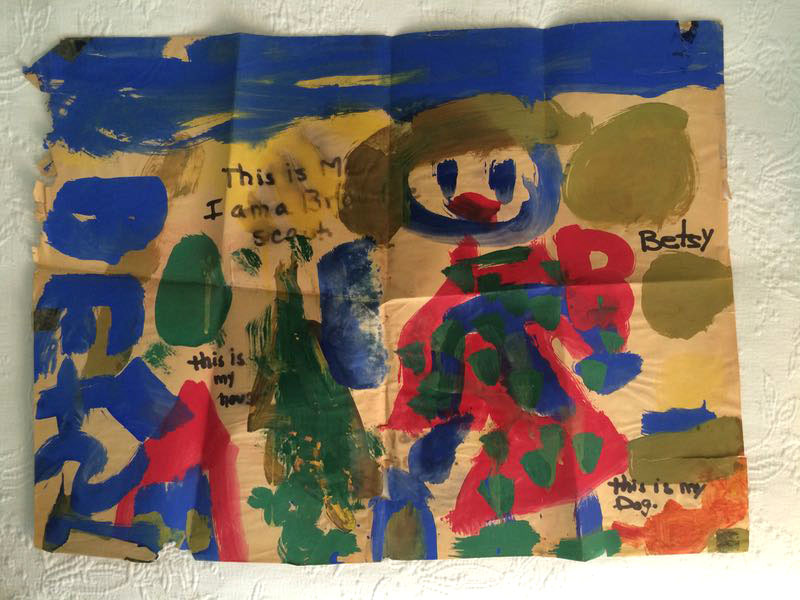 Cleaned out Started cleaning out the photo cupboard, where I found my First-Ever Selfie, painted when I was six years old and in Brownie Scouts. Interestingly, we didn’t have a dog at that time, even though I painted one in the picture (wishful thinking?). 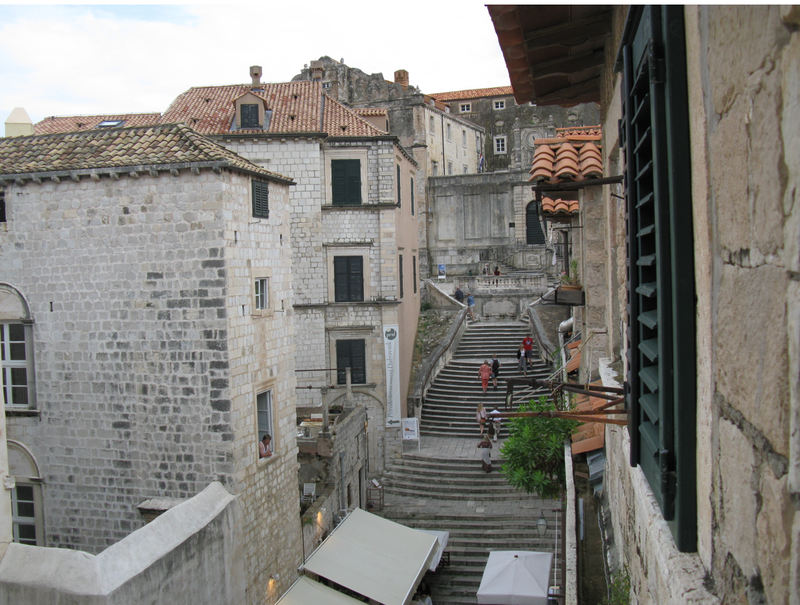 Found out that the street where we stayed in Dubrovnik, Croatia in 2014, was one of the sites used in Game of Thrones, a show I have never seen. In the top photo (taken from the web somewhere) is the scene from the movie. 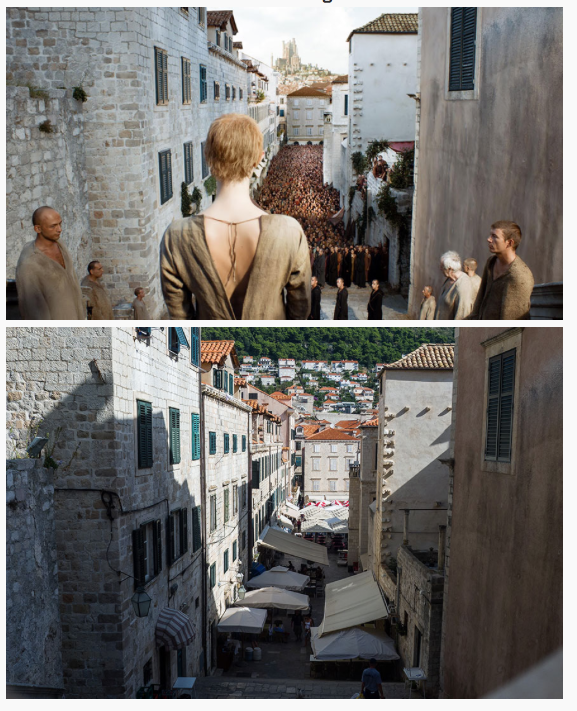 The middle photo is their comparison of how it looks when it’s not been movie-fied, and the bottom photo is taken by me, leaning out our window, looking back up the street. I found this out one day when I was reading the NEWSPAPER (yes, I’m that old) and saw the top photo. 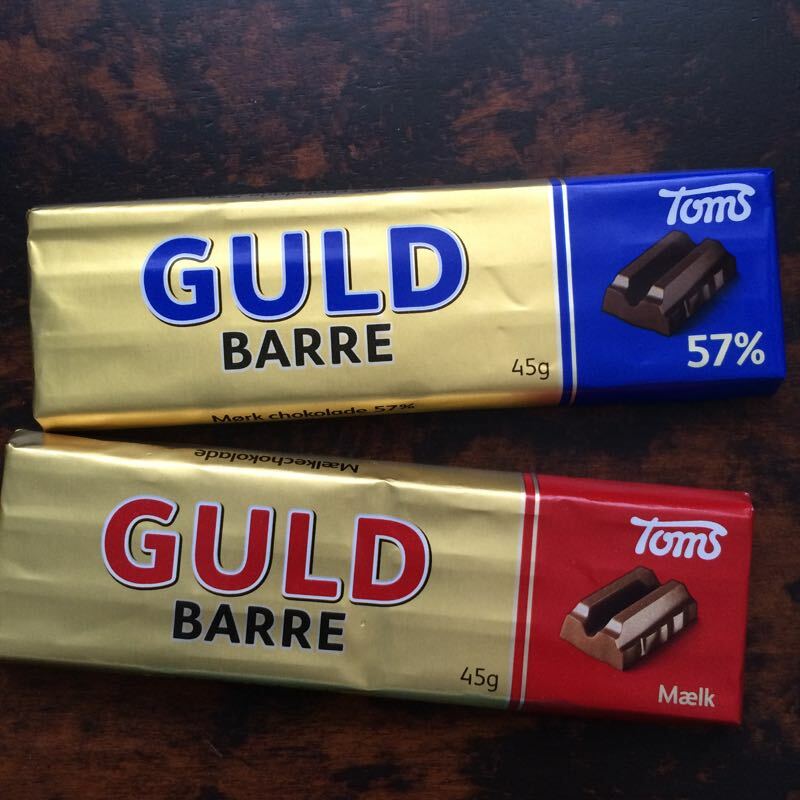 I ran upstairs to compare mine with theirs, then found the middle photo on the Internets. 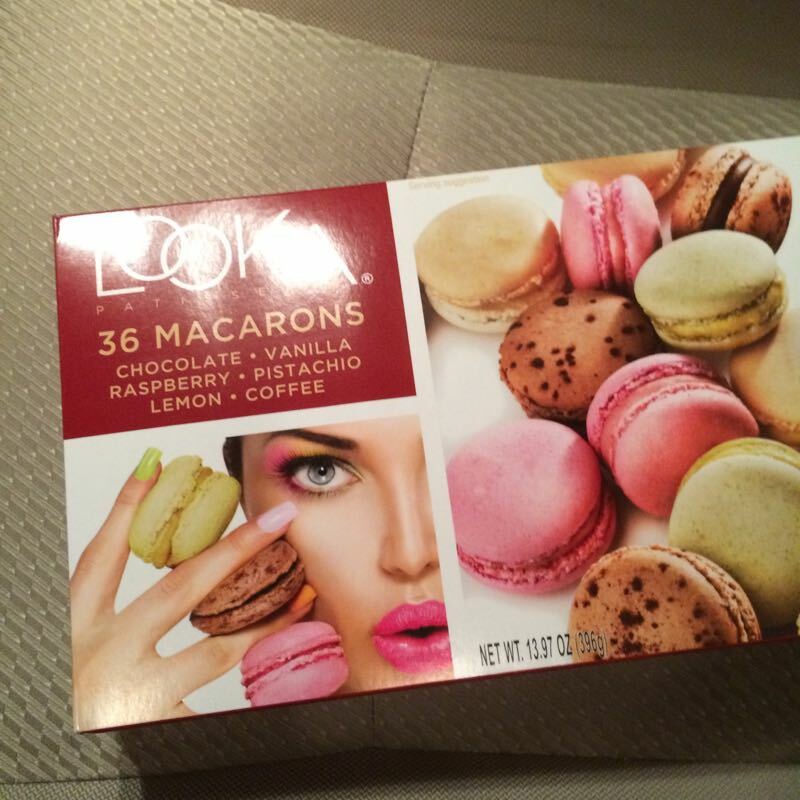 Another eureka moment was when I discovered that Costco sells macarons. Yes, I have two boxes in my freezer right now, but I gave away the coffee-flavored cookies to a neighbor (I hate the taste and smell of mocha/coffee). I’ve also gotten three bids on a new HVAC system, and one guy is wandering around my house right now, taking mea$urement$. 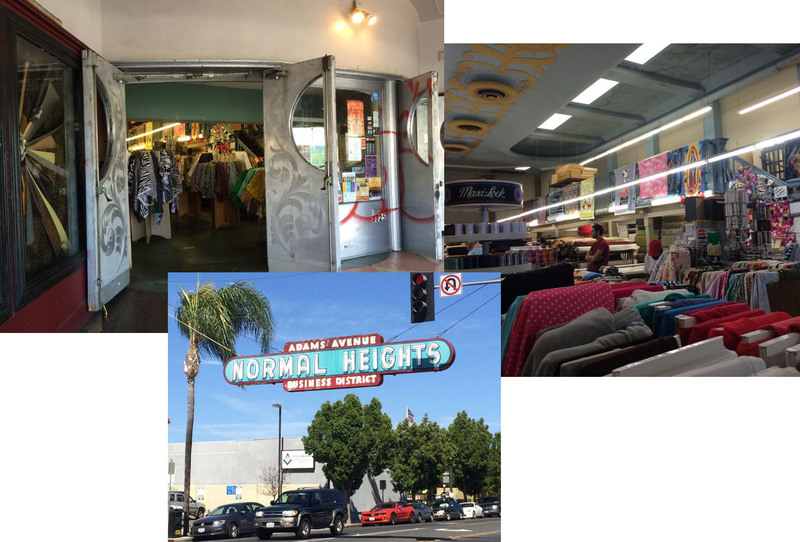 Found out there is a fabric store in Normal Heights, in a former movie theater, which had some silk shantung, perfect for working on my Four-in-Art project for the May reveal. I’ve also been to the doctor’s twice, but the patient — like Mayor Shinn’s wife in the movie The Music Man — will recover. Coming soon to a blog near you, on May 1st. 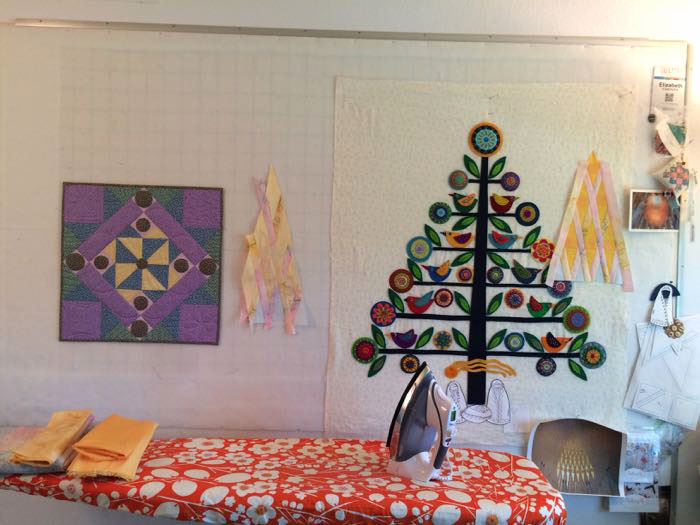 And my design wall last week, as I was figuring out a scene for under the Christmas Tree (next step is coming May 2nd), working on my Four-in-Art art quilt, and enjoyed a completed mini–a sample to check on how my pattern worked for some more market sewing, which I’ll show you very soon. (You know the game.) Now back to the sewing.